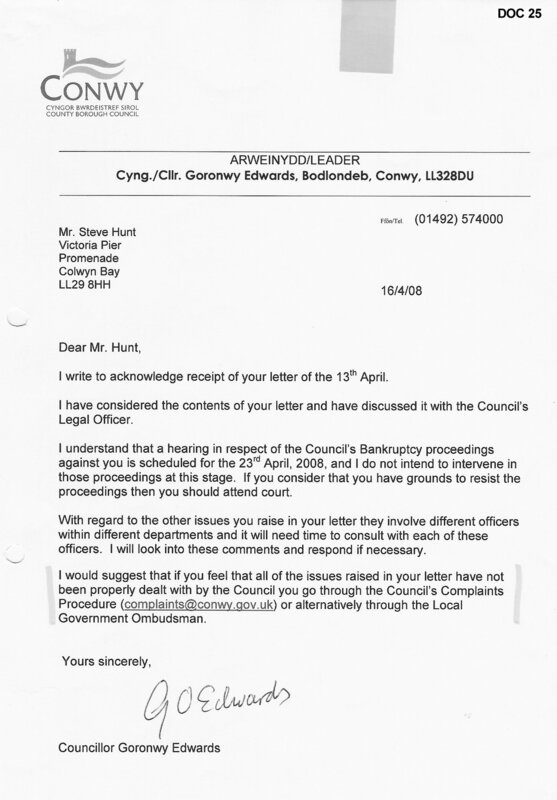 The story of how the criminal actions of the corrupt Conwy County Borough Council managed to bankrupt me on a pack of LIES sworn to a Court of Law take a lot of reading and digesting. This is a very long and seemingly complex affair, though in reality it is very simple: CCBC ARE LIARS. CCBC went to Court, LIED, completely and deliberately denied me a fair trial, and the Judge for reasons best known to himself chose to ignore the most basic principles of English Law, the Civil Procedure Rules, the Insolvency Rules and most importantly the Human Rights Act, and took sides with the LIARS. This tells you all you need to know about the so-called 'Justice System'. The reason this page is so long is that there is lot of detail, and a lot of documentary evidence to prove my seemingly outrageous claims are TRUE. 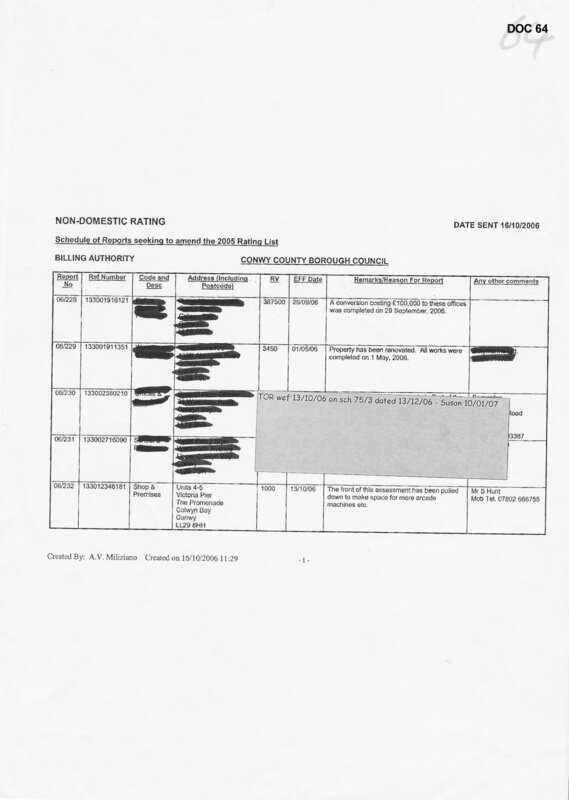 The 'devil is in the detail' - CCBC tried so hard to cover their tracks, but by carefully noting persons and dates, you can see which officers knew which facts at which times, and what lies they actually told the Courts. There is 100 or so pages of evidence, all in their own dirty hands. The other reason for so much careful detail is that I appreciate to most, the whole sorry saga just sounds so far-fetched that it surely can't possibly be true? - well, as I say, every accusation is backed fully by evidence in CCBC's own documents, or screen shots from CCBC's own computers, CCBC's own internal emails, CCBC's memos etc. If you get to the bottom in one go (or at all!) then well done... you will then have an understanding of just how corrupt and sick minded the filth that slither around the corridors of Bodlondeb really are. North Wales Police, who SHOULD be investigating these very serious crimes, refuse to do so. 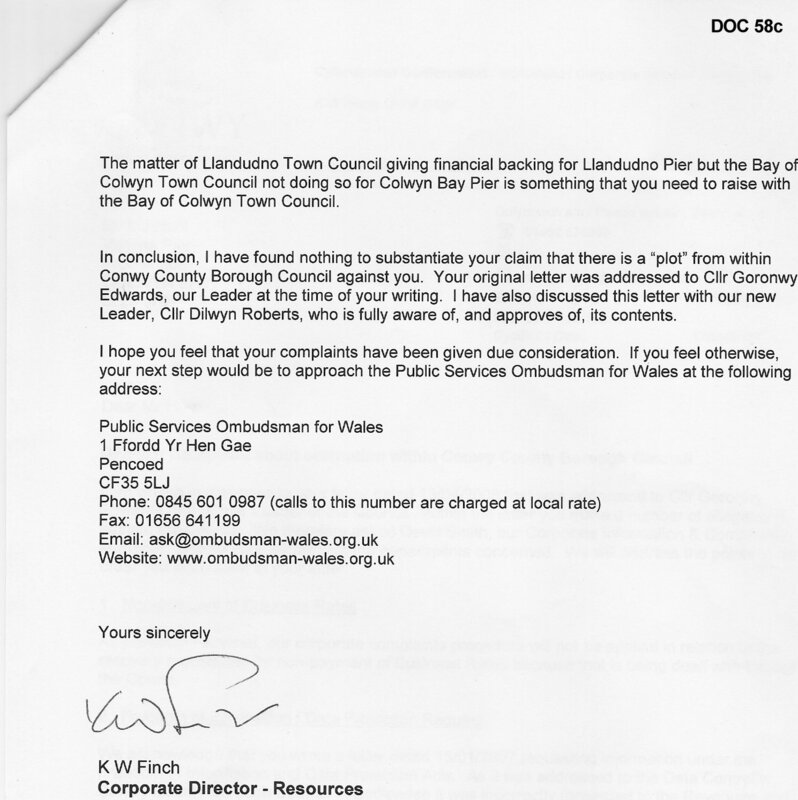 The Public Services Ombudsman for Wales, who SHOULD be investigating the serious malpractice of Council Officers, refuses to do so. The local media, who have been offered this evidence for nearly 2 years, are too terrified to say anything serious against CCBC. So, I decided it is time the public had access to some of this evidence, to get an idea of what is going on. Perhaps there will be a journalist out there somewhere who actually has enough balls to take this story up? 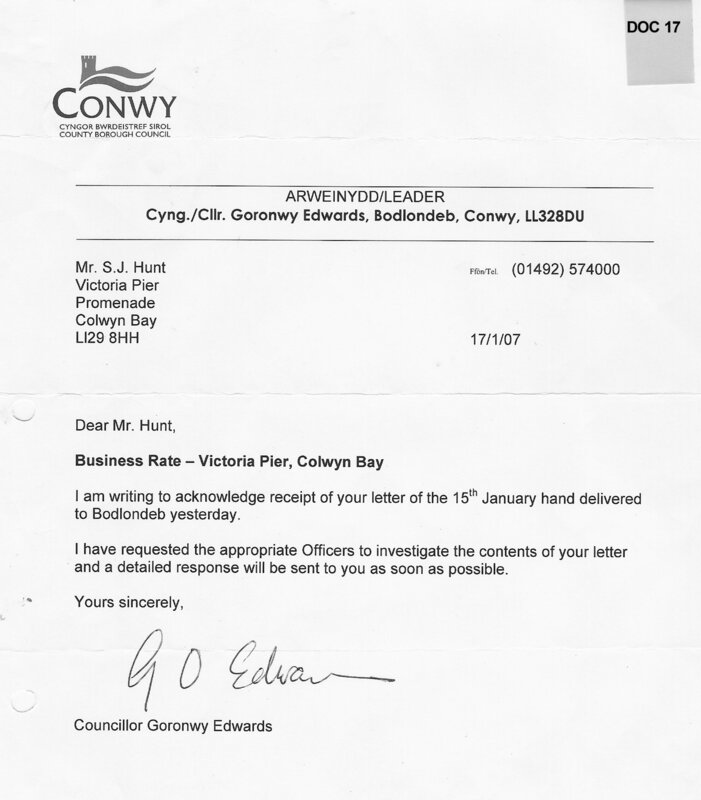 I have been in serious dispute with Conwy County Borough Council over Business Rates and Council Tax for many years. Indeed there have been disputes since I bought the Pier in December 2003. In a nutshell, CCBC demanded I pay bills which they absolutely knew were incorrect. In the case of business rates, the bills were wrong because I had variously demolished the premises the bills applied to, or I had tenants in them and so was not personally liable for the rates. 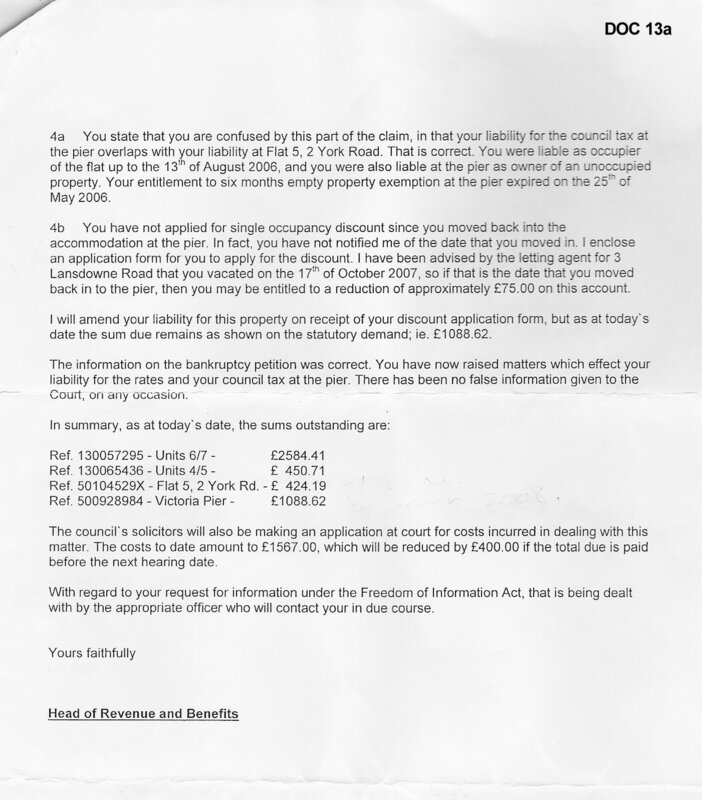 In the case of council tax, CCBC had not applied single occupancy discounts, and I also discovered that CCBC were deliberately hiding and withholding an overpayment I had made of almost £100. I refused to pay the bills, since they were incorrect. CCBC were given dozens of chances to correct the bills, but they refused. I offered to 'sit around the table' and discuss the matter, CCBC refused. I offered to pay half of their false claims, some £2,500 - even though I knew it was wrong - whilst the details were sorted out, CCBC refused to talk AND even refused to take my money! CCBC were absolutely determined NOT to settle the matter. Evidently this was not about the money, CCBC were hell-bent on making me bankrupt by any means, even if it meant falsifying accounts and lying to the Courts. Eventually CCBC issued a Statutory Demand (the first part of the process towards bankruptcy proceedings) in the sum of £5,144.88. CCBC absolutely knew this amount was both untrue and in dispute. Naturally I disputed this demand, but again CCBC refused to talk about it or correct it. CCBC then issued a bankruptcy petition, knowing full well that the bills were in dispute, and knowing the amount claimed was untrue. 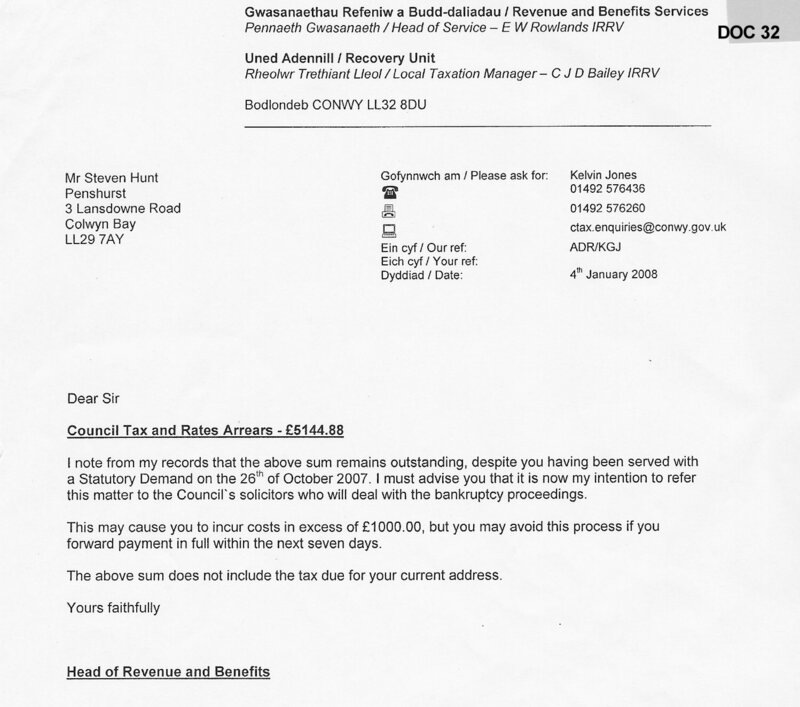 Unknown to me at the time, CCBC were also concealing and withholding around £100 council tax overpayment I had made to them - which was not credited to the amount they stated I owed. Again I disputed the bankruptcy petition, and tried to resolve the matter, but yet again CCBC refused to talk. Throughout the whole period, I tried to obtain all the information CCBC hold about me and my business in order that I could calculate the correct sums owed myself and pay them off. However, CCBC consistently refused to supply this information, even under official Data Protection Act and Freedom of Information Act legal demands - breaking two laws in the process. Due to CCBC refusing to supply any information, I was denied a fair trial of the bankruptcy at court. Quite simply, I could neither substantiate the sums CCBC claimed, nor prove anything I might have argued in my defence, as I was unlawfully denied access to MY information about ME. I believe this was a deliberate attempt to pervert the course of justice, since CCBC knew that the evidence I sought, if provided, would likely result in their case being struck out - as you will see further on. I was made bankrupt on 17th July 2008 on 'evidence' of CCBC's false accounting and knowingly untrue statements they submitted to the Court, all of which I was unable to defend as CCBC unlawfully denied me access to MY information. It seems complicated, as everything is interconnected, but if you are interested then go through it slowly and all will be revealed by reference to CCBCs own documents. 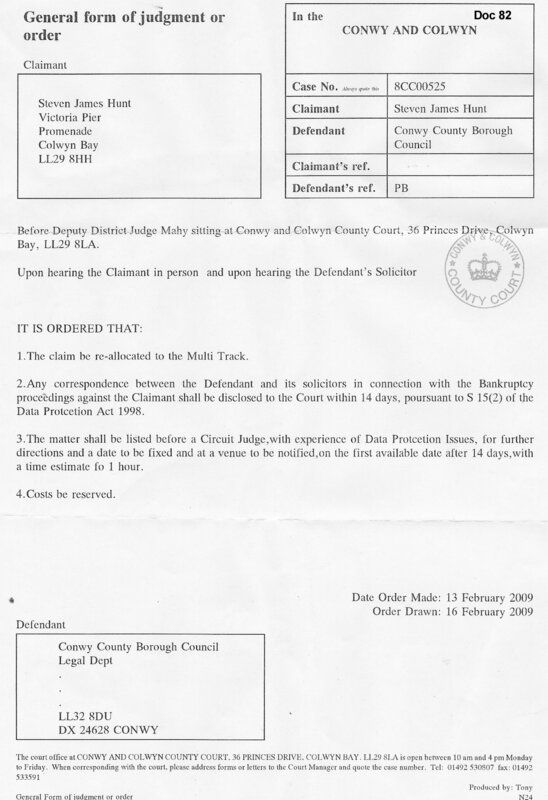 CCBC, and their solicitors DWF LLP, knowingly and wilfully lied to the Court at the hearing of the Bankruptcy Petition on 17th July 2008. This is a matter of fact, proven by the following evidence in the hand of CCBC or DWF LLP. 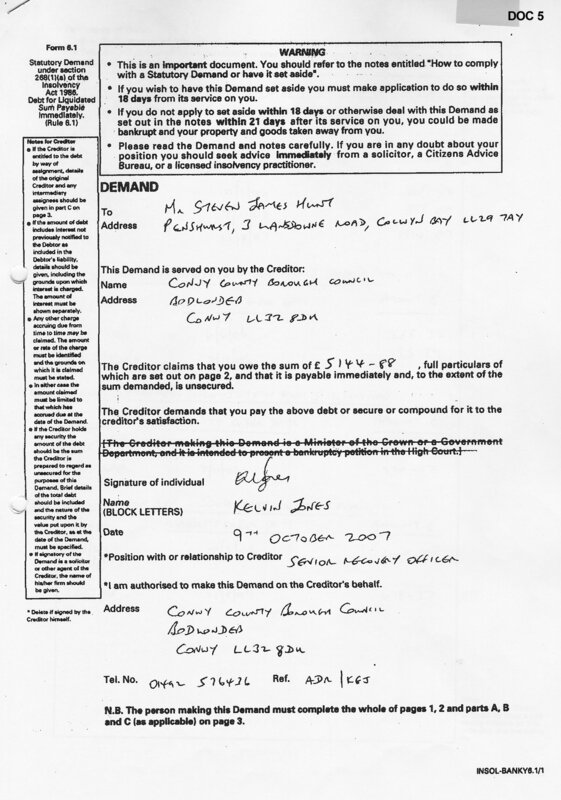 Therefore both Kelvin Jones of CCBC and DWF LLP Solicitors were fully aware the alleged debt on which the petition is founded (the statutory demand) was incorrect from at least 8th May 2008. 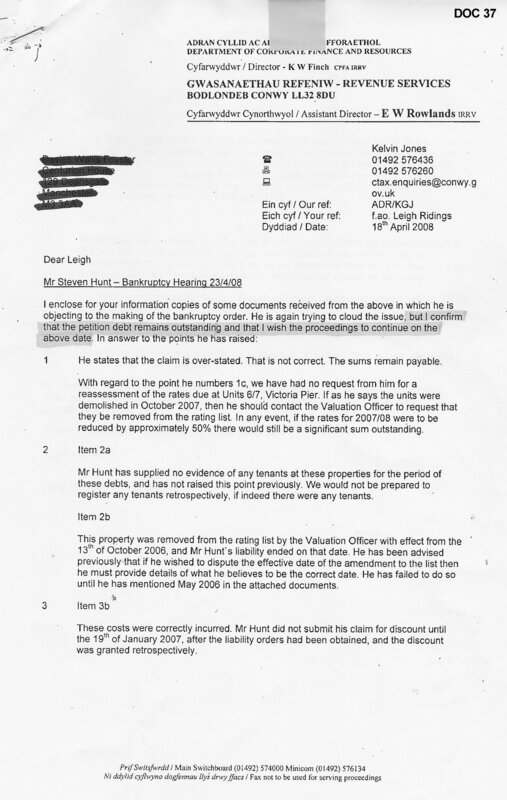 This statement was known by DWF LLP to be untrue at the time they made it to the Court, since Kelvin Jones had admitted to DWF that the alleged debt was not true on 8th May 2008. Did or did not DWF LLP make enquiries of the petitioning creditor (CCBC) within the last business day prior to the adjourned hearing (I.E. 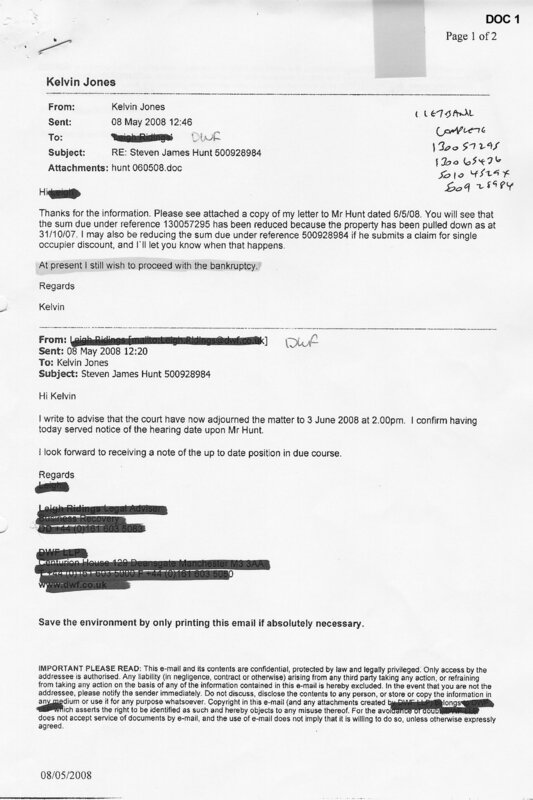 on 16th or 17th July 2008) as per their written statement?. If they did not, then that statement in itself is a lie and constitutes perjury. Why did DWF LLP state to the Court that the debt on which the petition is founded (I.E. the debt stated in the statutory demand as being £5,144.88) was still due and owing, when Kelvin Jones had told DWF LLP that it was not true? 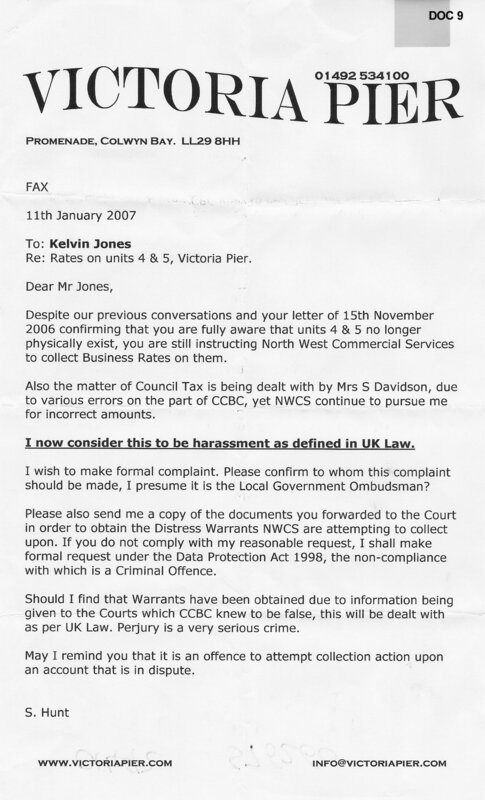 Did Kelvin Jones directly instruct DWF LLP to submit this false statement to the Court? - he previously instructed them to proceed with the bankruptcy even after admitting his alleged 'debt' was untrue. DWF LLP are aware of the correct legal procedure when the amount of alleged debt has changed since the issuing of the bankruptcy petition, which is to apply for Leave of the Court to withdraw the bankruptcy petition, correct the amounts on the petition, and then re-start the process again. Kelvin Jones, as a 'Senior Recovey Officer' should also be aware that this is the correct legal process to follow. Ignorance of the law is no defence in any case. 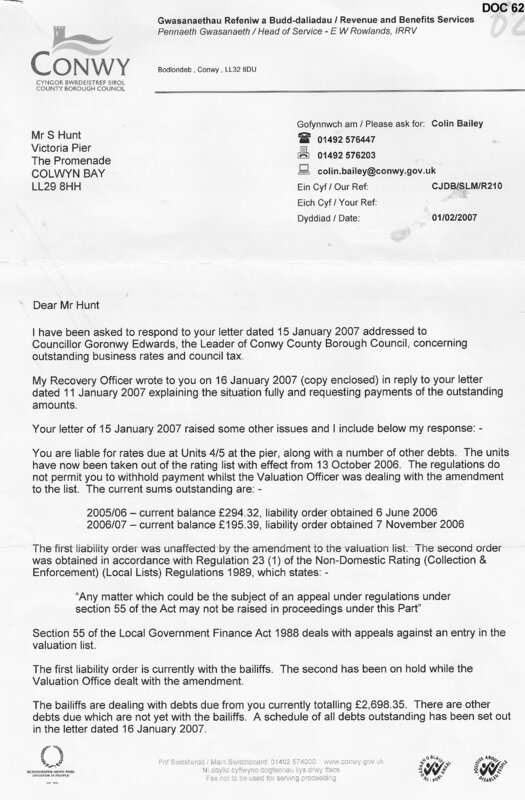 Below I set out evidence obtained from CCBC that proves the amount of alleged debt as stated on the Statutory Demand was known to be both false and in dispute at the time it was issued in October 2007. 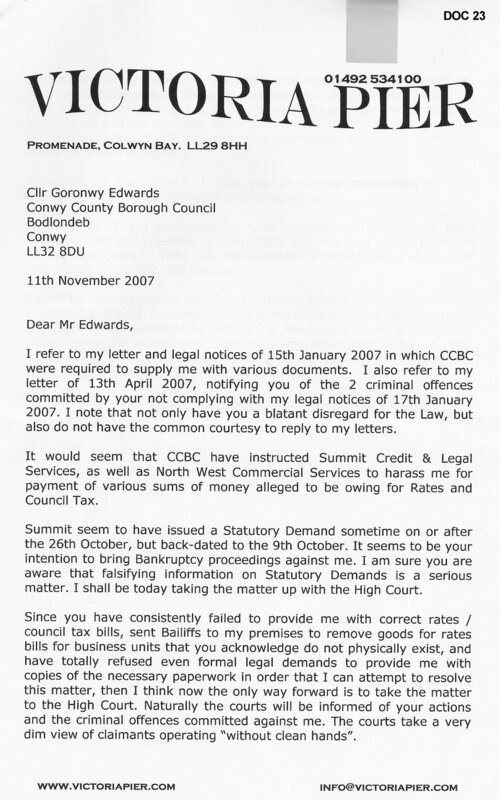 A Statutory Demand issued by CCBC came into my hands on 8th November 2007. 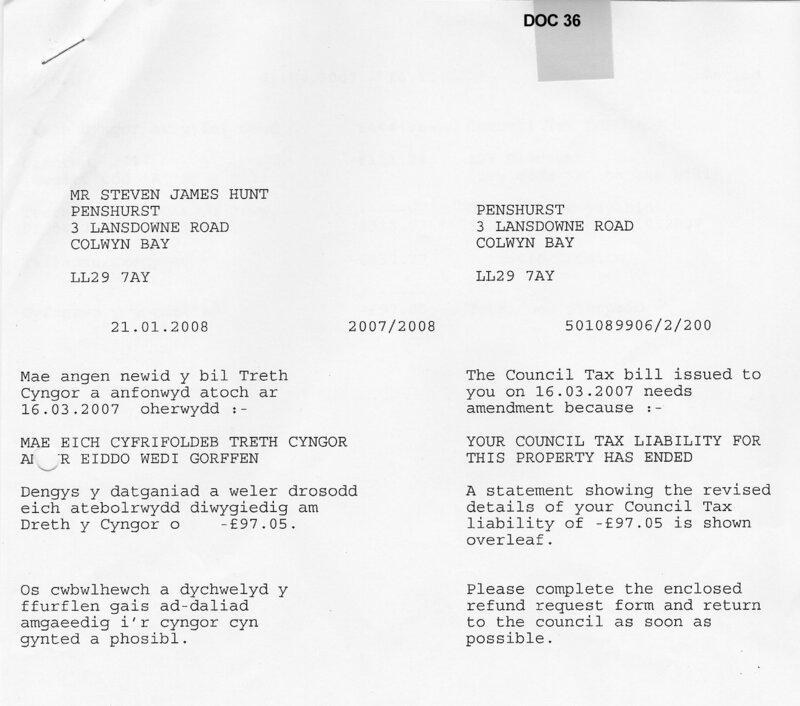 [doc 5] Note: although the Statutory Demand is dated 9th October 2007 it is stated to have been left at 3, Lansdowne Road, Colwyn Bay by the process server on 26th October 2007 [doc 6] & [doc 6 page 2] I vacated this property on 17th October 2007 as confirmed by the Landlord of the property following CCBC's own investigations [doc 7] I returned to the property on 8th November 2007 to collect my deposit from the Landlord, who gave me the envelope containing the statutory demand. The Statutory demand [doc 5] is split into 4 main parts, all of which are incorrect. relates to units 6/7. This was the old pier bar, which was closed in October 2007 and subsequently demolished. 1a: This part appears to be correct, though it does contain an amount of costs. 1b: This part appears to be correct, though it does contain an amount of costs. However, CCBC was informed by telephone in late summer of 2007 of the intention to close and demolish the bar, when advice was sought from them as to what planning and licensing applications would have to be made and approved before the works could commence. 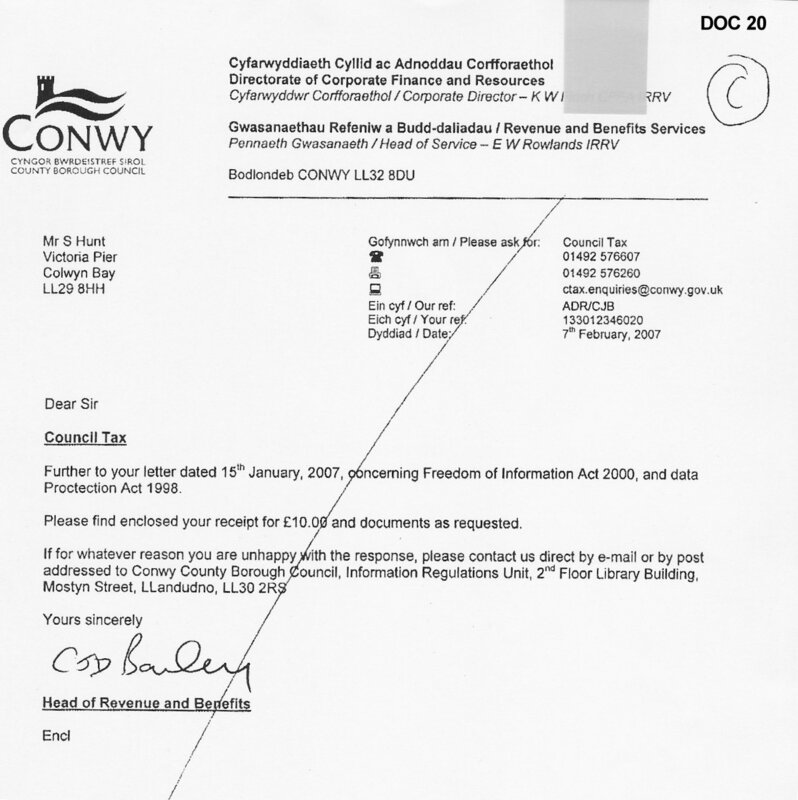 Also CCBC received my planning/licensing application and cheque for the £170.00 fees for the changes to the bar on 16th November 2007 as shown in the receipt of payment to CCBC [doc 44] and a letter from CCBC which also confirms the application was processed [doc 45] Therefore CCBC are clearly lying by stating they didn't know the premises had been demolished, since THEY had given me permission to demolish and rebuild them! I cannot be held responsible for CCBCs inefficiency in this regard, and therefore I should not have to pay costs for them failing to do their jobs correctly. It is not my fault they did not act on information in their possession for months! 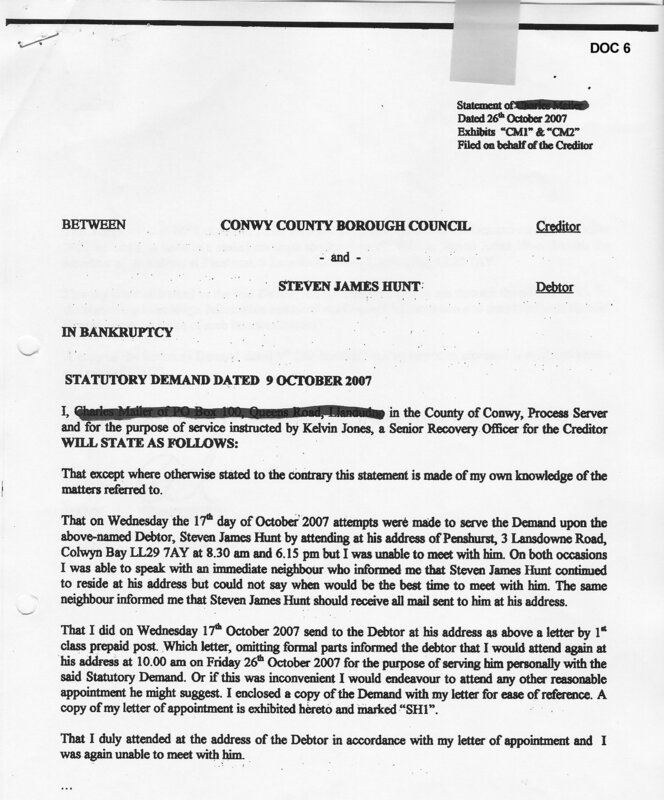 This therefore proves that at the hearing of the bankruptcy petition on 17th July 2008, Kelvin Jones knew that the amount as claimed in this part of the statutory demand was untrue, and that by proceeding with the bankruptcy he was making a fraudulent claim in a Court of law, since he knew with absolute certainty that I did NOT owe CCBC £5,144.88 as he claimed. When CCBC filed the bankruptcy petition, they were well aware the bar had been closed and demolished - they had given permission for it! So why did they persist in hounding me for rates on it for a further 7 months? Kelvin Jones admits to his solicitors I do not owe the alleged debt, but instructs them to make me bankrupt anyway! - BOTH are guilty of PERJURY by claiming in Court that I owed £5,144.88. 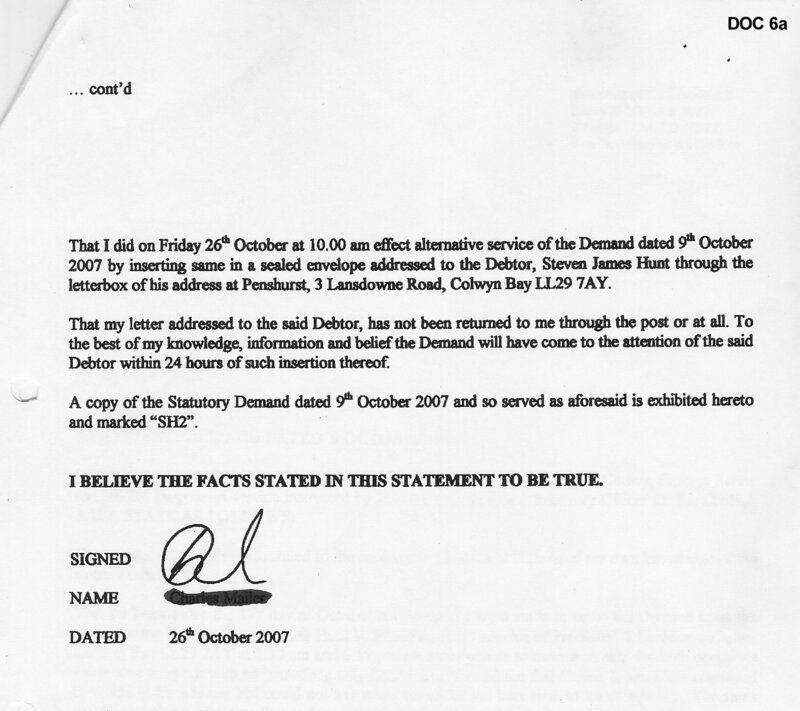 Why did Kelvin Jones and DWF LLP submit a false written statement to the Court that the amount owing on the statutory demand was correct, when they both absolutely knew it was a complete lie? Not only did they lie to the Court - PERJURY - but did so in an attempt to obtain money from me which was not owed - FRAUD by false representation. relates to units 4/5 at the pier. These were shop units that formed part of a 'terrace' of small shops. This is the longest running part of the dispute. 2a: As I stated to CCBC many times, I was not operating a business from these premises during this period. The premises were either let unsuccessfully for short periods to various tenants, or empty. 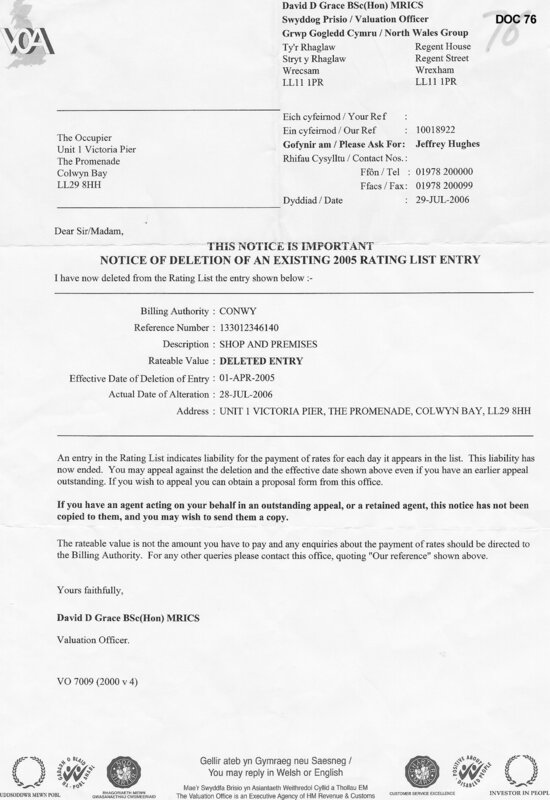 Since I was not operating any business during this period, nor using the premises for any other rateable purpose, the Law states quite clearly that I am not personally liable for Non-Domestic Rates thereon. It is not MY problem at all! In other words, "we've been to Court and lied once to get the Liability Order, so I'm sure we can get away with it again..." Kelvin Jones was far more interested in trying to make me bankrupt than in complying with the Law. 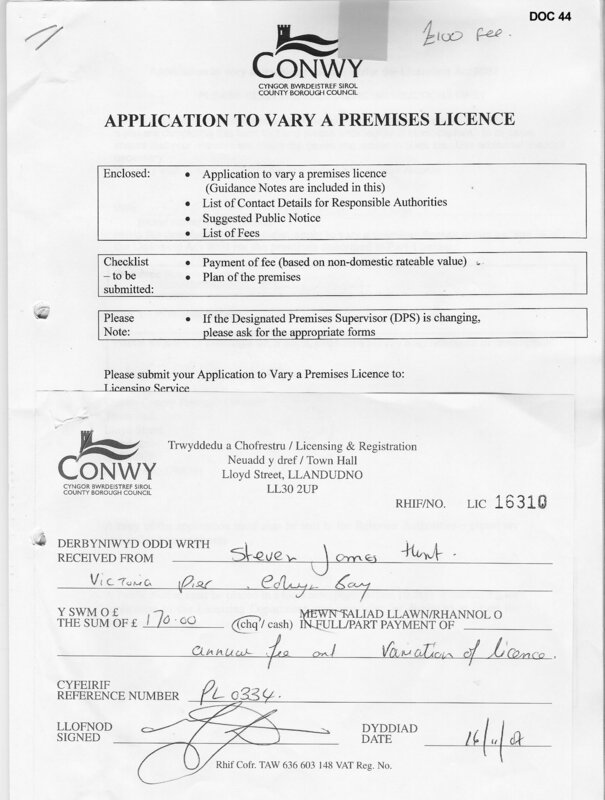 If Kelvin Jones continues to accuse me of being liable for NDR on these premises, then he must provide evidence that I was trading from these premises, or using them for some other rateable purpose. Otherwise I have no liability to pay NDR on them. The onus of proof is with him to prove I am liable for rates, not with me to prove I am not. 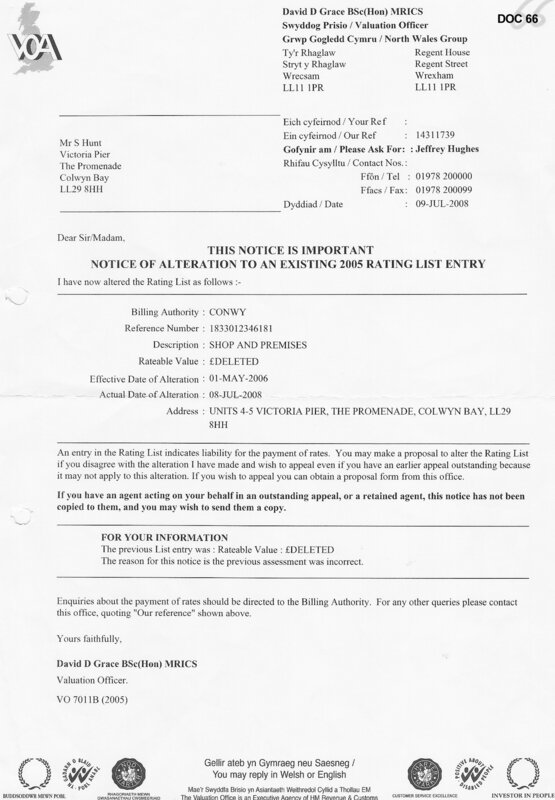 2b: The original amount of £195.39 claimed by CCBC was disputed as the units were demolished in May 2006. However, the bill was still not corrected until just a few days before the hearing of the bankruptcy petition in July 2008. It is not my fault that Kelvin Jones decided to take 21 months to issue a correct bill, why should I pay the costs for his failure to do his job? 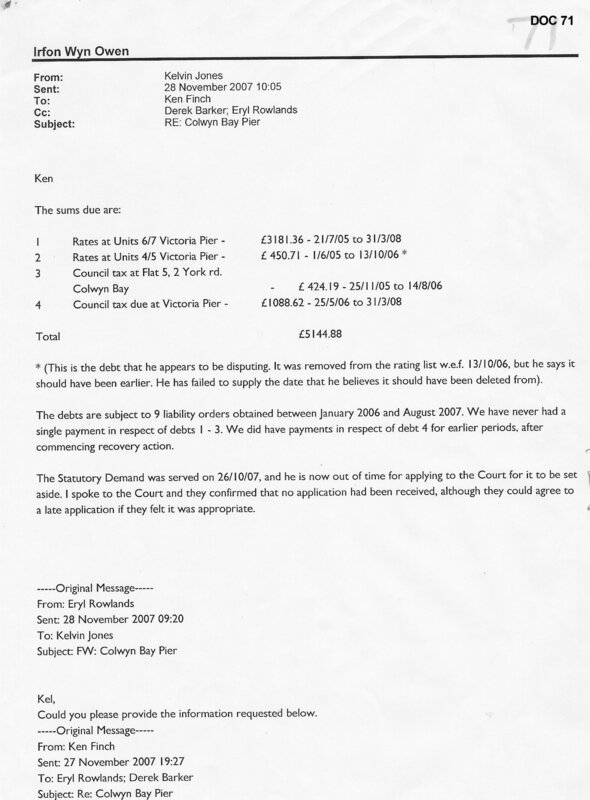 This proves again that at the hearing of the bankruptcy, Kelvin Jones knew that the amount as claimed in this part of the statutory demand was untrue, and had known this for 21 months!. He knew that by proceeding with the bankruptcy he was committing PERJURY and FRAUD by making a false claim in Court that I owed £5,144.88. 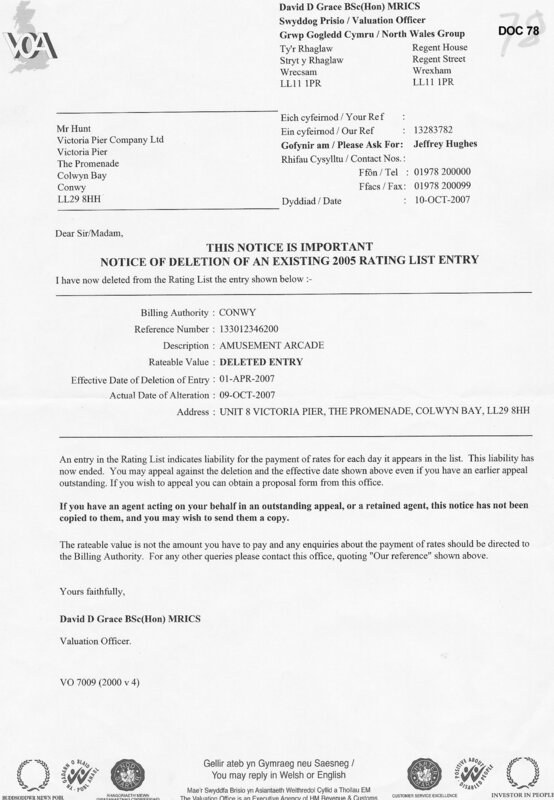 Kelvin Jones, Colin Bailey and Eryl Rowlands were aware of the dispute over this matter since 2006, but refused to sort it out or send a correct bill. It is proven that the amounts stated in this part of the statutory demand were known to be incorrect, and falsely claimed for on the statutory demand. I had been protesting about this part of the bill for around 2 years, so If CCBC were correct, why did they suddenly decide to change the amount they alleged I owed just 13 days before the hearing of the bankruptcy petition? Did they suddenly get 'cold feet'? And having changed the bill, why did they falsely state to the Court that the debt as claimed on the statutory demand was "still due and owing", when by their own admission and actions this was clearly known to be untrue? Again lies to the Court, to make me pay them money which I did not owe. Again PERJURY and FRAUD. relates to a flat I rented for a while in town. Costs are unjust as CCBC should have applied the discount and billed me correctly, giving me opportunity to pay, before taking the matter to Magistrates Court. 3b: CCBC originally claimed £581.72 was owed. This was incorrect because not only was the amount vastly over-stated, but also my single persons occupancy discount had again not been applied. CCBC put a claim for the incorrect amount through the Magistrates Court on 7th November 2006 (even though I had moved out on 14th August 2006) and obtained a liability order for the incorrect amount of £581.72 plus £59 costs. Costs are again unjust because CCBC should have corrected the bill, applied the discount, and given me chance to pay the correct amount owing before taking the matter to Magistrates Court. Clearly both parts were previously in dispute, and both are proven to have been incorrect in the first place, otherwise why did CCBC alter them? The question remaining is over the costs issue, which cannot be just. Why should I pay costs when CCBC decided to take Court action in an attempt to force me to pay bills which yet again they knew were incorrect? They should have sent me correct bills, which would have been paid. relates to the flat on the pier. 4a: There was some confusion with this part of the claim as it overlapped dates with the part of the claim set out in 3b. Clearly I could not physically live in two places at once. However, in a telephone conversation with CCBC they claimed that I was liable for living in one property, and also liable as the owner of an unoccupied property at the other. This part of £409.85 appears to be correct then, although it also includes an amount of costs. 4b: This part of the claim is yet again incorrect as it does not include my single person occupancy discount of 25%. 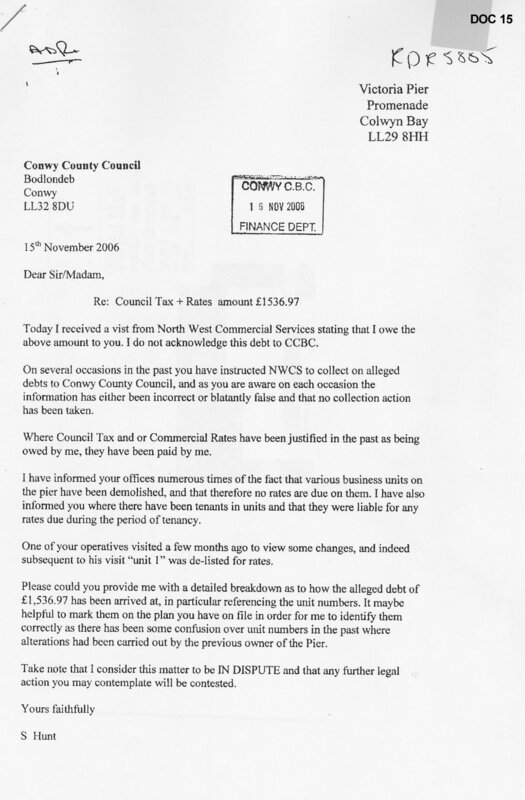 In CCBC's letter of 6th May 2008 they admit that there should be a discount of approximately £75.00 on the amount claimed. 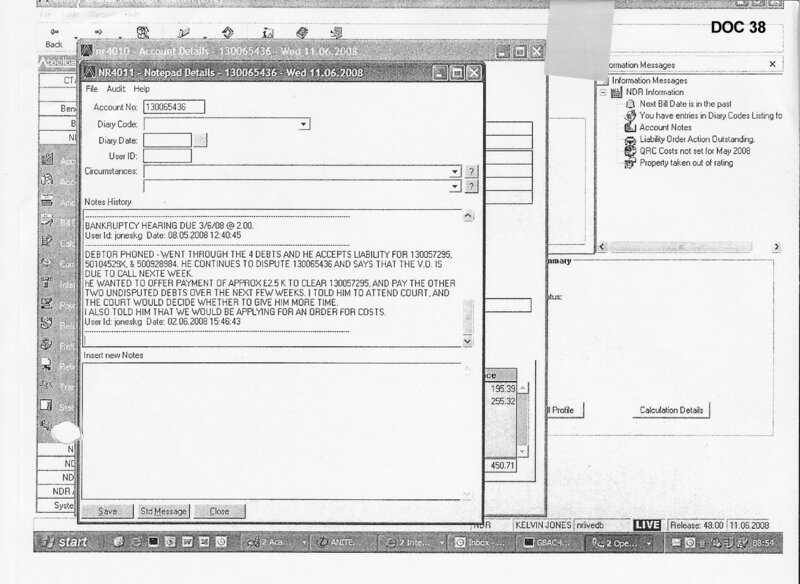 [doc 13, page2] However, despite sending back the appropriate form to Kelvin Jones [doc 14], he never corrected the bill for this part. 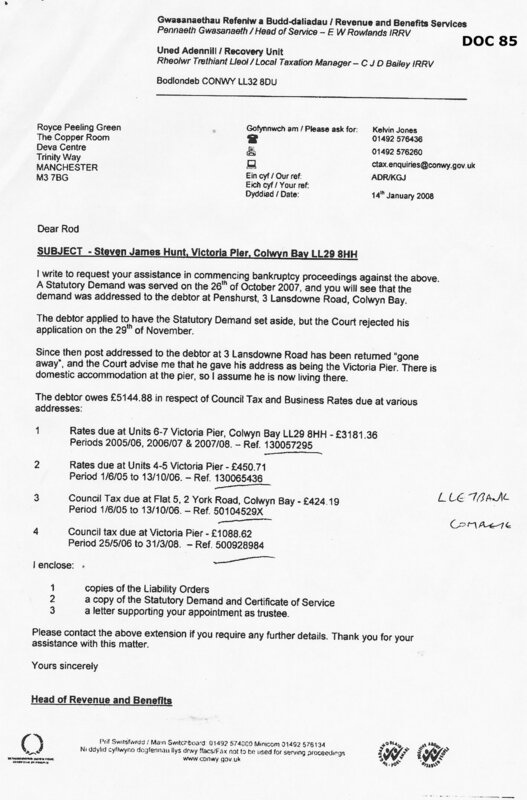 On 2nd June 2008, Kelvin Jones carried out a search of my credit file at Experian, without my permission, [doc 80] allegedly in order to confirm that I was the sole occupier of the residential accommodation at Victoria Pier and therefore entitled to the 25% Single Occupier Discount as I claimed on the form I sent to him [doc 14]. The credit record shows it indeed to be the case that no-one else lived at the pier, yet Kelvin Jones still did not apply the discount. Why did Kelvin Jones really do this search, when he states on 16th January 2009 [doc 81] that he has never received the discount form [doc 14] from me? If he is stating I had not made the claim for discount, then he made the credit search illegally, as he had no lawful reason in place to carry it out without my permission. If he did receive the form, and carried out the search to validate my claim, then why did he not apply the discount which was clearly due? This LIAR cannot have it both ways. Since he had the credit report in his hand on 2nd June 2008, he DID know the discount was due. 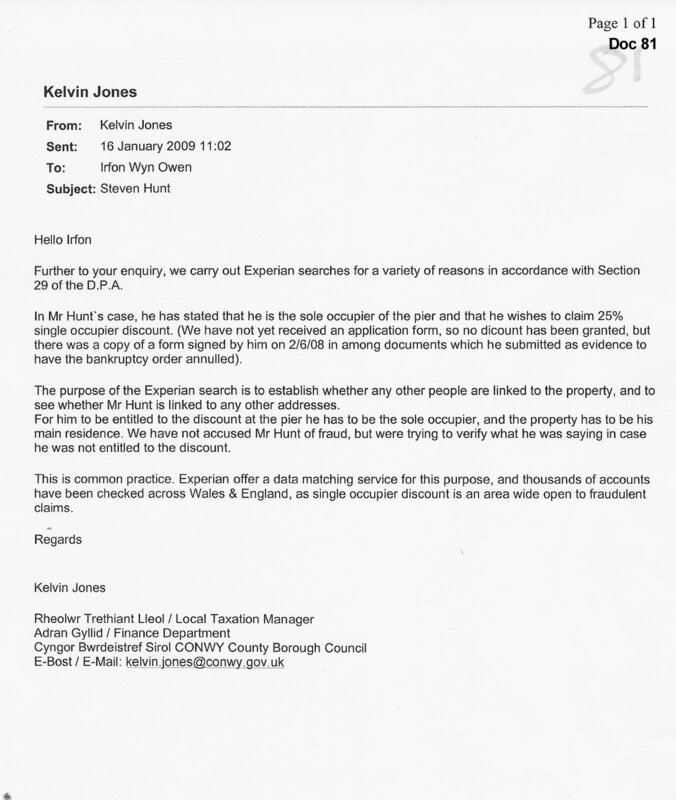 Did or did not Kelvin Jones receive the discount application form [doc 14]? Regardless of whether or not it was done legally, Kelvin Jones DID obtain the credit search which confirmed the 25% discount was due, so why did he not correct the account? Kelvin Jones knew by his own, possibly illegal, investigations that this part of the claim was untrue over 6 weeks before the bankruptcy hearing, yet once again he lied to the court in order to defraud me of money he absolutely knew I did not owe. This is PERJURY and FRAUD once more. 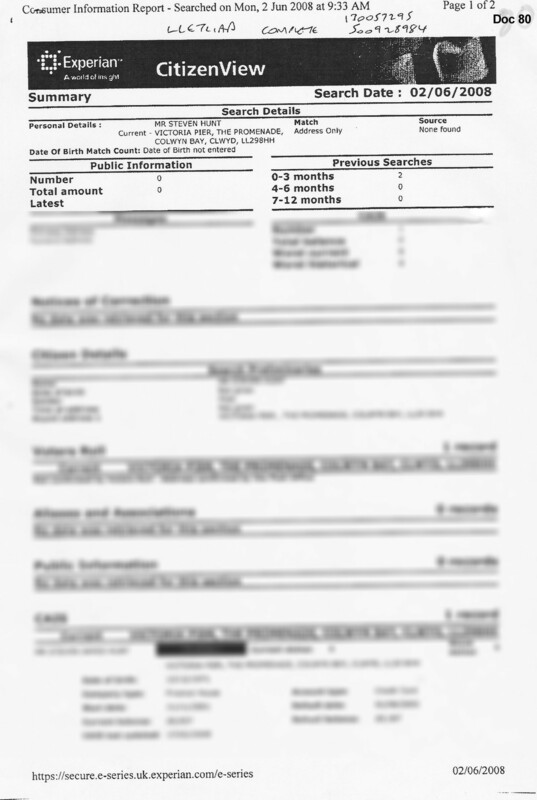 The Court dismissed my application, though I do not understand why. Probably because I could not actually substantiate what I said with any evidence at that time, since CCBC was unlawfully withholding all the documents I needed to prove any of the above. "A petition preceded by a statutory demand shall not be dismissed on the ground only that the amount of debt was over-stated in the demand, unless the debtor, within the time allowed for complying with the demand, gave notice to the creditor disputing the validity of the demand on that ground"
The Statutory Demand was disputed with CCBC on the grounds that the amount of debt was over-stated. Where a Statutory Demand is disputed, the person issuing the demand is supposed to resolve the dispute before filing a bankruptcy petition against that statutory demand. The above evidence in section 2 proves beyond any doubt that the Statutory Demand was known to be over-stated by CCBC and in dispute with them in parts for 2 years before it was even issued. It is also shown that I disputed the claim on that basis and in time as per Insolvency Rules / Statutory Instrument SI 1986/1925 r.6.26(3). Therefore the bankruptcy petition should have been dismissed on these grounds, however for reasons unknown the Court proceeded. "he is now out of time for applying to the Court for it to be set aside. I spoke to the Court and they confirmed that no application had been received" [doc 71] However, I had filed an application to set aside on 25th November [doc 12], confirmed by the Court on the 27th November [doc 72] Not sure where Kelvin Jones was getting his 'facts' from? - just lying yet again it would seem. "On the hearing of the petition, the Court may make a bankruptcy order if satisfied that the statements in the petition are true, and that the debt on which it is founded has not been paid, or secured or compounded for." 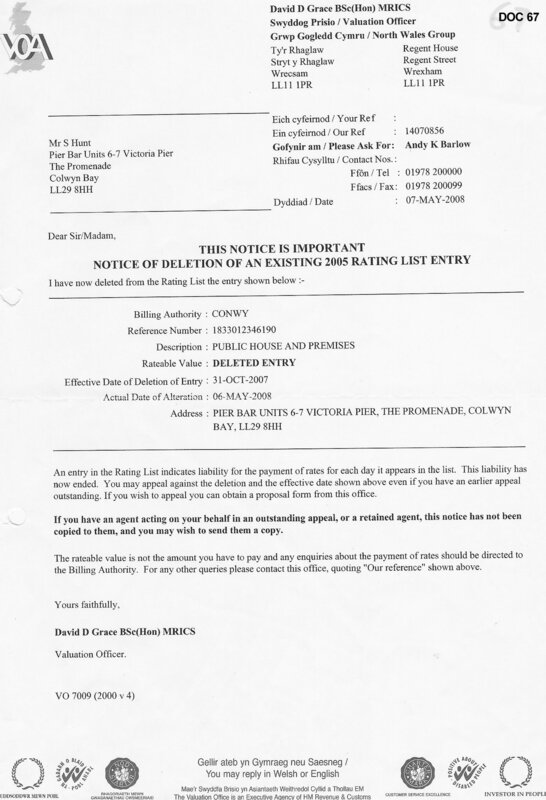 On 6th May 2008 CCBC wrote to me saying they would correct the sum of £678.77 with a reduction of approximately £75.00 (being part 4b of their claim) on receipt of the appropriate discount form from me. 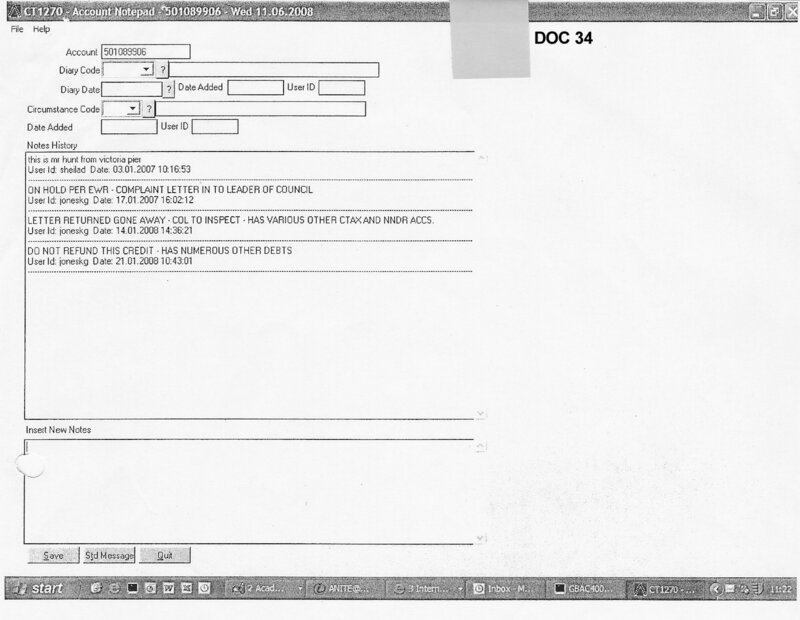 [doc 13] This was sent to CCBC on 2nd June 2008 [doc 14] but CCBC never sent a corrected bill for this part of their claim. Kelvin Jones can't make his mind up whether or not he received this form - he either lies to say he did receive it, or lies to say he didn't receive it, to suit whatever question he is being asked at the time as we see in section 2.4 above. On 4th July 2008 CCBC issued a new bill for £97.74 [doc 2], replacing the one as stated in the claim (part 2b) for £195.39. 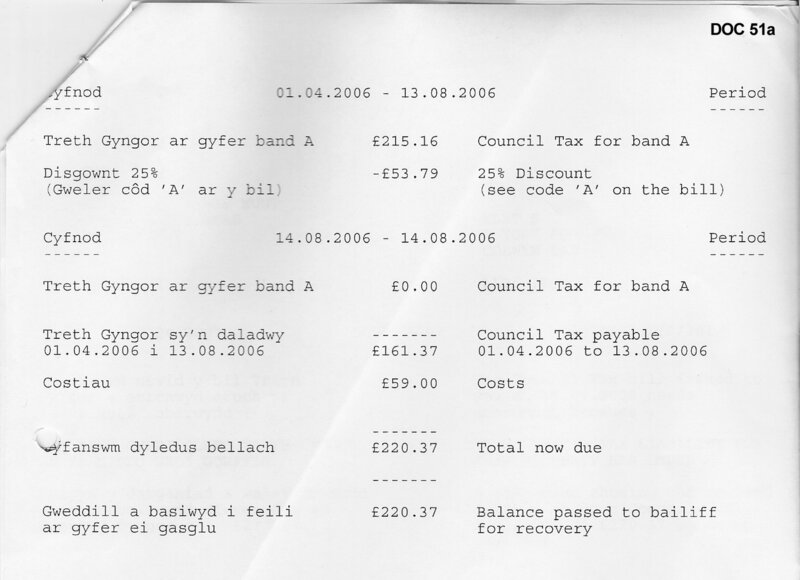 On 11th July 2008 CCBC issued a new bill for £917.05 [doc 3], replacing the one as stated in the claim (part 1c) for £1,514.00. Therefore at the hearing of the petition on 17th July 2008 CCBC cannot dispute they were fully aware that the amount claimed for in the Bankruptcy Petition was untrue, since CCBC had admitted, by the issuing of new bills before the hearing as per the above evidence, that the claim was over-stated to the sum of almost £770.00 and wrong in material fact on at least 3 separate points. The correct legal procedure was for CCBC to apply for Leave of the Court to alter or withdraw the Petition and submit a new correct one. Such new petition should have been served upon me according to the Insolvency Rules. CCBC, having the benefit of in-house solicitors and also having secured the services of a large external firm of solicitors (DWF LLP) to represent them at Court, are well aware of the correct legal procedure. CCBC petitioned the Court for my Bankruptcy stating the facts of the case were true, whilst by their own admission as proven in their own documents [doc 1] [doc 2] [doc 3] [doc 13] they absolutely knew this to be untrue. DWF LLP also absolutely knew this was untrue. In short, CCBC and their solicitors LIED to the Court in order to make me bankrupt and to defraud me of money they knew I did not owe. This cannot possibly be just or legitimate. This is a clear case of PERJURY and FRAUD and PERVERTING THE COURSE OF JUSTICE. 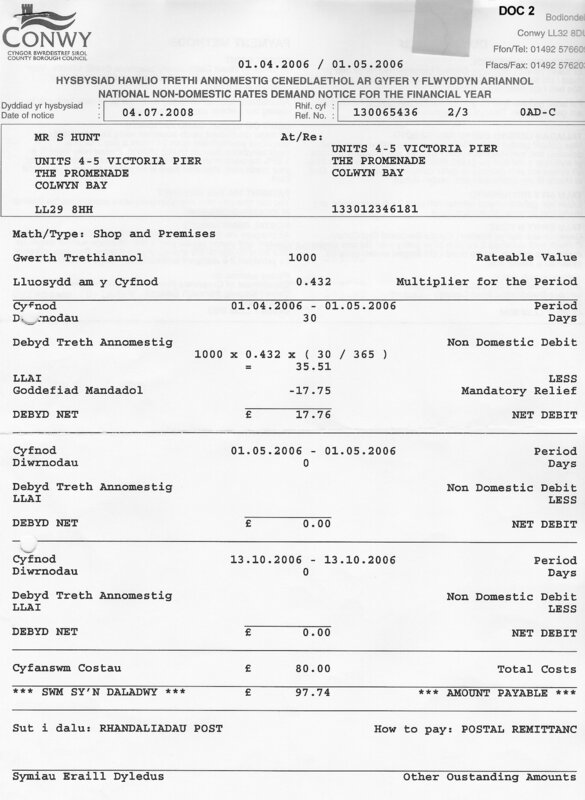 Why did CCBC claim I owed £5,144.88 when they absolutely knew this was untrue? 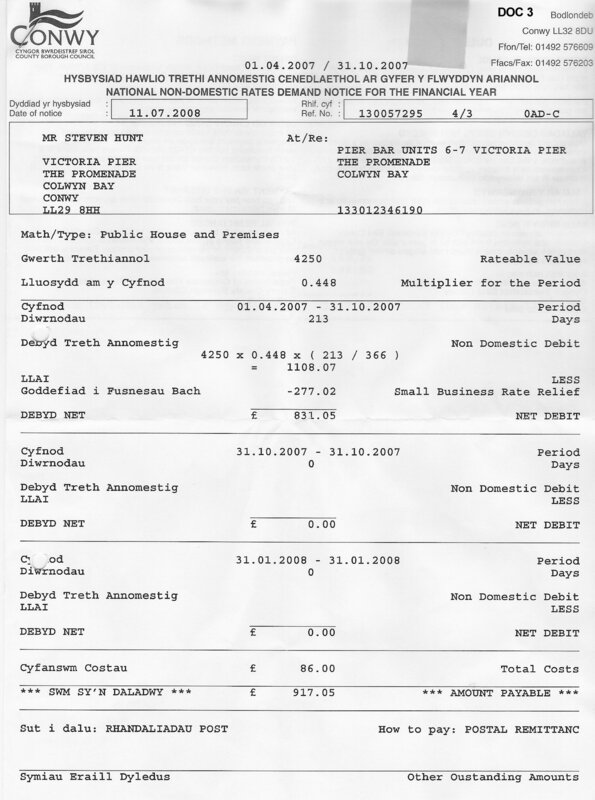 This cannot be dismissed as "a mistake" or "computer error", since both CCBC and DWF LLP were both well aware that the original alleged debt had been altered considerably. Kelvin Jones knew that the claim was untrue on numerous different counts. 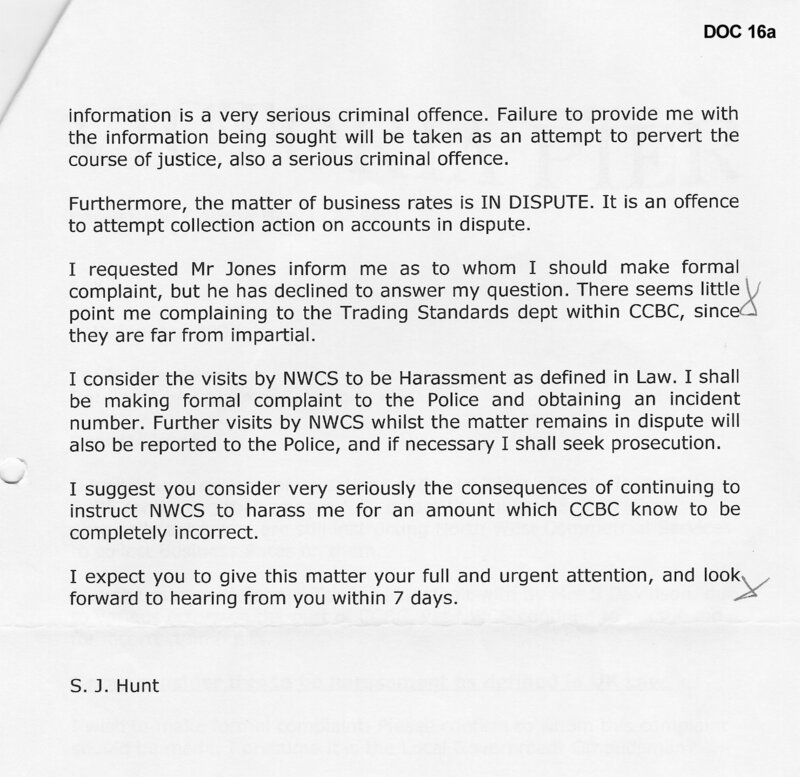 Why did CCBC and DWF LLP both wilfully lie to the Court? Why did they not inform the Court that the amount of alleged debt had changed? Why did they not follow correct procedure in withdrawing the petition? 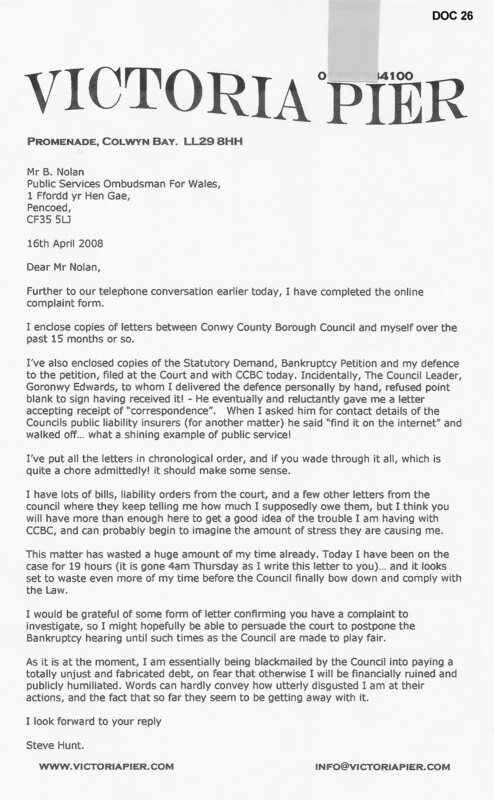 The reasons for all these LIES, quite simply, is that Kelvin Jones and CCBC were utterly determined to make me bankrupt at all costs, and quite prepared to lie to the Court, and persuade their solicitors to lie to the court, in order to do so. Whilst the offences CCBC has committed under the Data Protection Act and Freedom of Information Act are mostly civil rather than criminal offences, they are inextricably linked to the criminal offences, and I believe the refusal to supply information is intended as a way of covering up other unlawful and illegal acts carried out by CCBC. The fact that CCBC so vehemently refuse to give up information, wilfully breaking the law in the process, even going against the directions of the Information Commissioner, is clearly significant in this whole matter. If CCBC had nothing to hide, they would have sent me the information I requested in January 2007, rather than face and LOSE legal action against I brought against them. There are some very strange goings on with this part of the saga, including secret meetings and strange emails going around the same old names yet again... and various other little anomalies. I have no doubt that this was deliberate on the part of CCBC, since had the Court known the real facts of this case as now illustrated here, the case would have been thrown out of Court, as not only was it against Court Procedure Rules, but there was actually no case the Court could legitimately hear. CCBC had no requirement to actually prove to the Court that any of their 'evidence' was true, since the filing of statutory demands and bankruptcy orders, along with the affidavits that are submitted to Court with them, are the equivalent to making statements under oath, so they are assumed by the Court to be truthful where there is no evidence to the contrary. Of course, CCBC knew I could not submit a single piece of evidence to the contrary, or indeed cross-examine any of their 'evidence', as CCBC were unlawfully withholding all the documentary evidence, to avoid me presenting it to the Court. A dirty, illegal, tactic which the Judge should NOT have allowed. The laws are crystal clear in this regard: The Data Protection Act 1998 gives the Data Controller 40 days from receipt of a request to comply with such request, or give a relevant reason for refusal. The Freedom of Information Act 2000 gives the relevant authority 20 working days from receipt of a request to comply with such request, or give a relevant reason for refusal. CCBC did not comply with either request in the prescribed time, committing offences under both laws. Not much then happened over the summer of 2007, as the pier being open 16 hours a day, 7 days a week during the summer took pretty much all my time up! 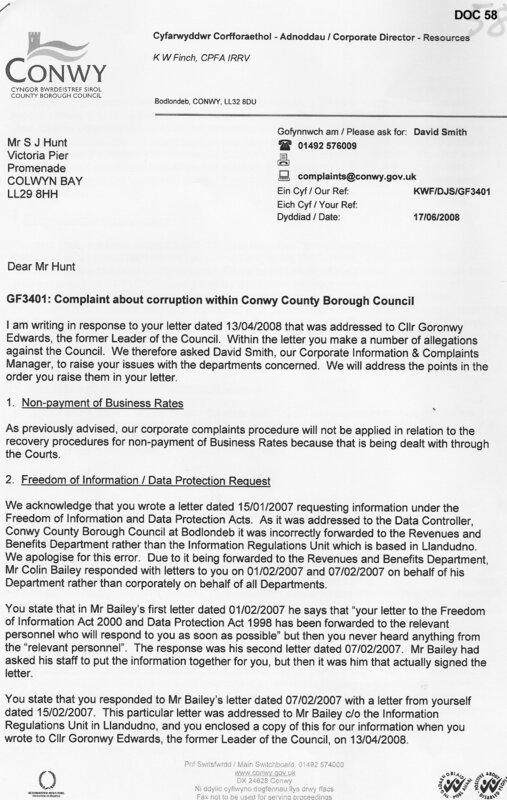 On 23rd November 2007 Ken Finch, Corporate Director of Resources at CCBC, wrote to me confirming that my complaint was "now being dealt with under Conwy's Corporate Complaints Procedure" [doc 11] and that Eryl Rowlands was the officer dealing with my complaint. Even after escalating to Corporate Complaint level, CCBC still refused to supply my information... 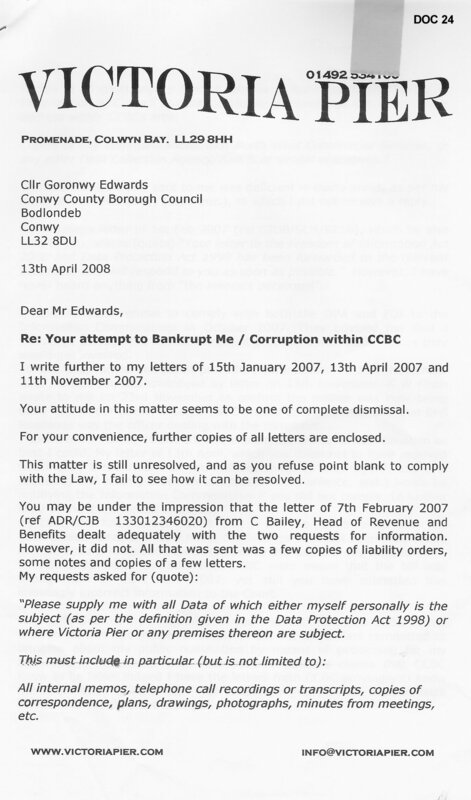 So on 13th April 2008 I wrote to Goronwy Edwards, leader of CCBC, again stating my DPA / FOI requests had still not been complied with, and the amounts alleged owing under the Bankruptcy Petition were still in dispute. 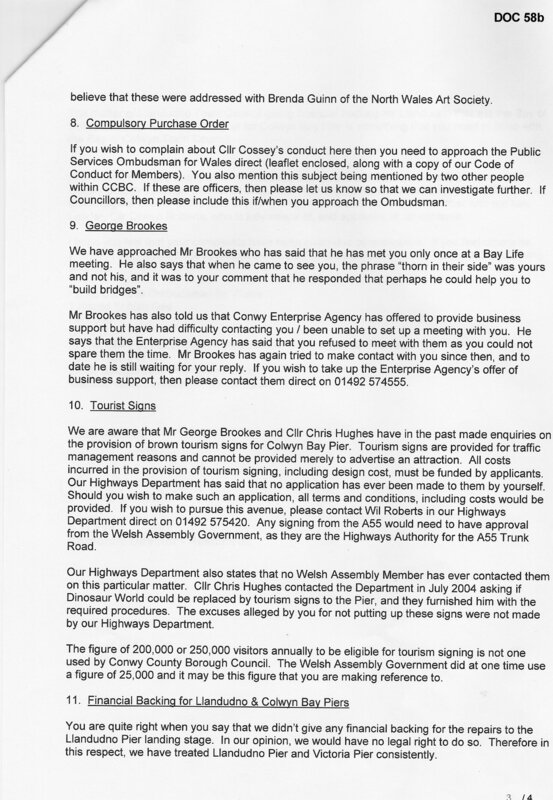 [doc 24 page 1] [doc 24 page 2] [doc 24 page 3] [doc 24 page 4] [doc 24 page 5] [doc 24 page 6] Notice this was also copied to various Councillors, including Cllr Chris Hughes, who was supposedly a "Friend of the Pier"
On 16th April 2008 I consulted with the Public Services Ombudsman for Wales, whom I had also sought telephone advice from previously, and lodged formal complaint with them. [doc 26] CCBC were made aware of this complaint by the PSOW. 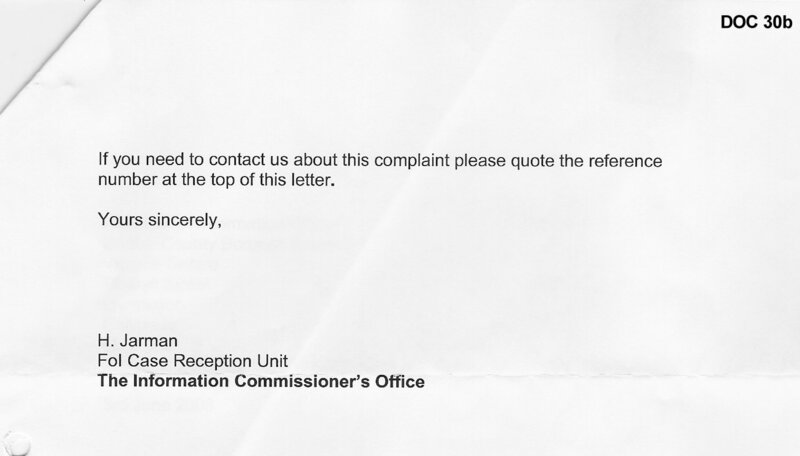 WHY hadn't Irfon Owen or his Information Regulation Unit had any involvement with regard to my complaint in the 7 months to this point in time that the "Corporate Complaints Procedure" had supposedly been running? - when it was that very department the complaint was about, for not complying with my information requests! - how can CCBC's "Corporate Complaints Procedure" work if they don't even investigate the very department / people that the complaint is about? 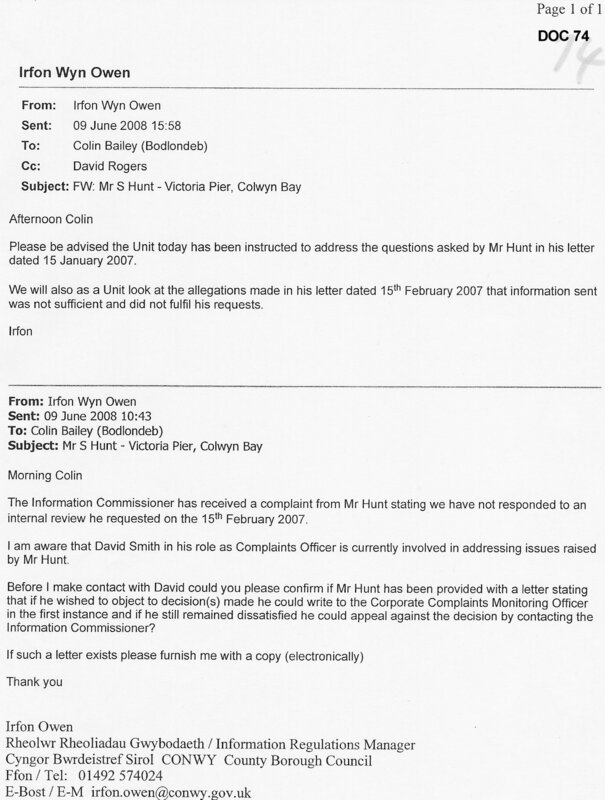 Also on 9th June 2008 Irfon Owen exchanged a couple of emails with Colin Bailey [doc 74] "the Unit today has been instructed to address the questions asked by Mr Hunt in his letter dated 15th January 2007" (that's 18 months earlier!). Since they are talking about questions, rather than information requests, I assume they are referring to [doc 16] & [doc 16 page 2] rather than [doc 18]. 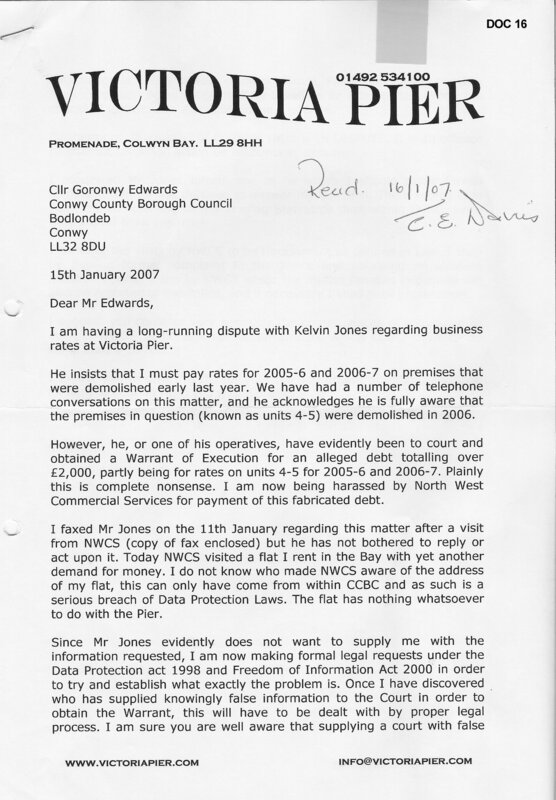 My letter [doc 16] & [doc 16 page2] is my complaint to Goronwy Edwards, leader of CCBC, about Kelvin Jones demanding I pay rates bills on premises he knows I have demolished, and his refusal to supply me with information! It is pretty much the first comprehensive complaint I made in writing. Now some 18 months after they received the letter, they were being "instructed" to deal with it. I particularly like the word he uses 'instructed', as opposed to 'asked' or 'requested' or 'advised'. 'Instructed' implies a reluctance on their part to do what they were told. Due to unfortunate cirumstances, as explained in part 8 below, I could not attend the actual bankruptcy hearing. As soon as I learnt of the judgment being made against me, I telephoned the Information Commissioner again to explain I had now been made Bankrupt as a result of CCBC lying to the Court and refusing to supply information with which I could have defended myself. 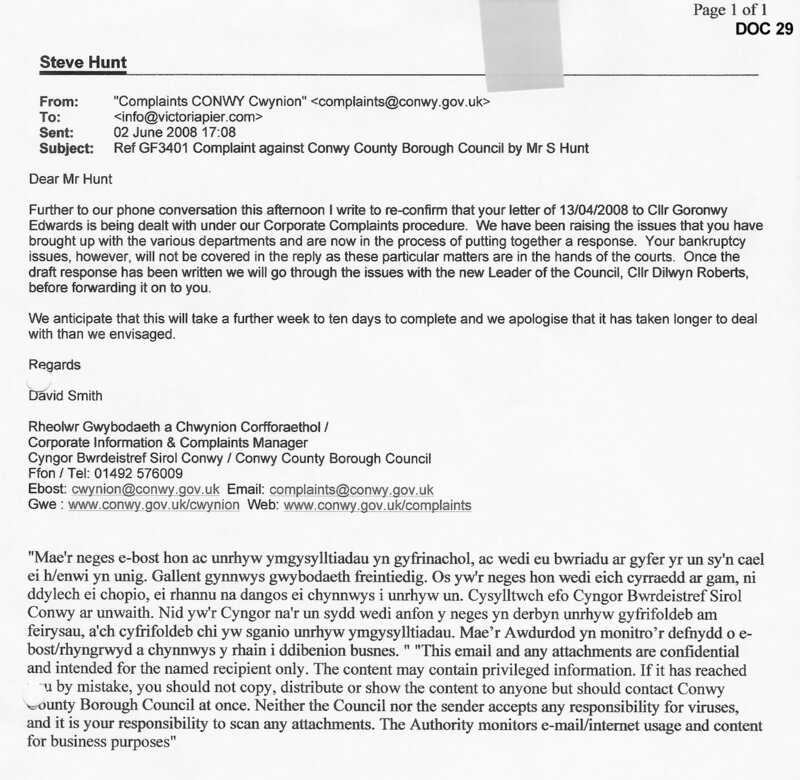 Amazingly, the Lady handling my complaint (ref RFA0199319) said she had only spoken to Irfon Owen at CCBC moments earlier - what a coincidence??? So I then telephoned Irfon Owen. He apologised that my request had not been dealt with, but stated the reason for this was that it had "originally gone to the wrong department", and that he "had only recently been made aware of my requests." He went on to say that he had done an initial search of CCBC's systems, and had tuned up 5,000 emails, and 3.5 copier paper boxes (I.E. about 8,000 sheets) of various other papers. He said that not all of these might be my data, for instance some might relate to the slipway next to the pier, and that his search had picked up on the keyword "pier", so he had to go through every document by hand and decide what could and could not be released to me under the law. He said that since he passed the pier on his way home each evening, he would drop a bundle of papers in each night until I had everything, but that it could take a couple of weeks. I said that was OK so long as I knew things were moving at last, and that I would eventually get it all. He said the first batch of information would be delivered to me at the pier on the afternoon of Friday 18th July 2008. In the event Mr Owen was unable to deliver this to me on the Friday, but I received it a few days later, followed by another 2 small packages over the next couple of weeks. 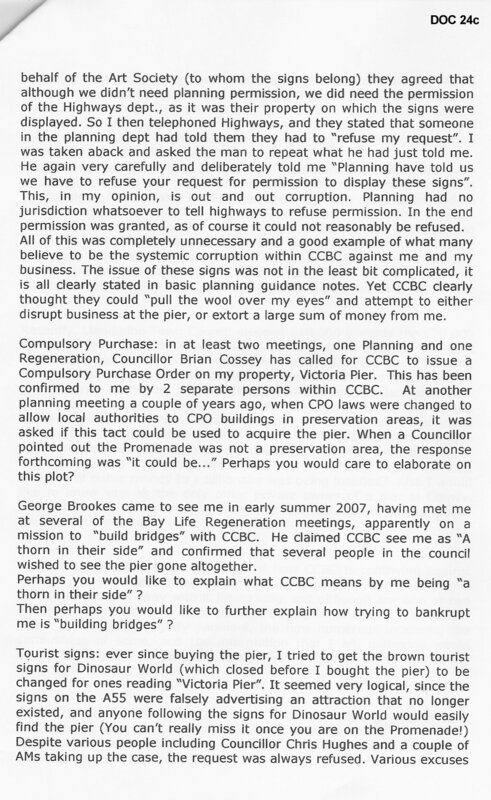 Having sought this information for 18 months, it seems a 'remarkable coincidence' that CCBC decided to start releasing it to me on 17th July 2008 literally a matter of a few minutes after I was made bankrupt. I do not believe for one moment that was just coincidence. I believe that CCBC had been deliberately withholding all my relevant information until AFTER the Bankruptcy hearing, knowing the information they held would result in the case being struck out by the Court, as it is now shown that virtually every aspect of their claim was untrue, full of holes, lies and leaves many questions. 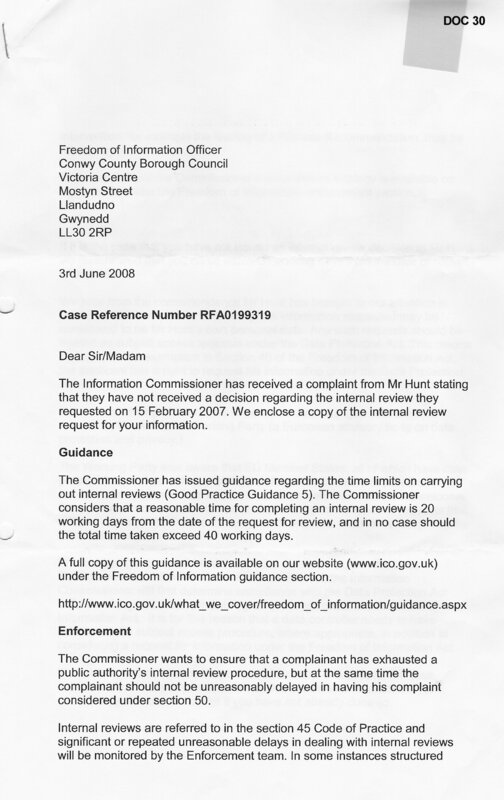 2 further small packs of information were sent to me in October 2008, along with a letter stating that I now had all the information due under my information requests [doc 56] This was yet another LIE - In January 2009 I was still due information from whole departments within CCBC, the lie was proven later in Colwyn Bay Court. 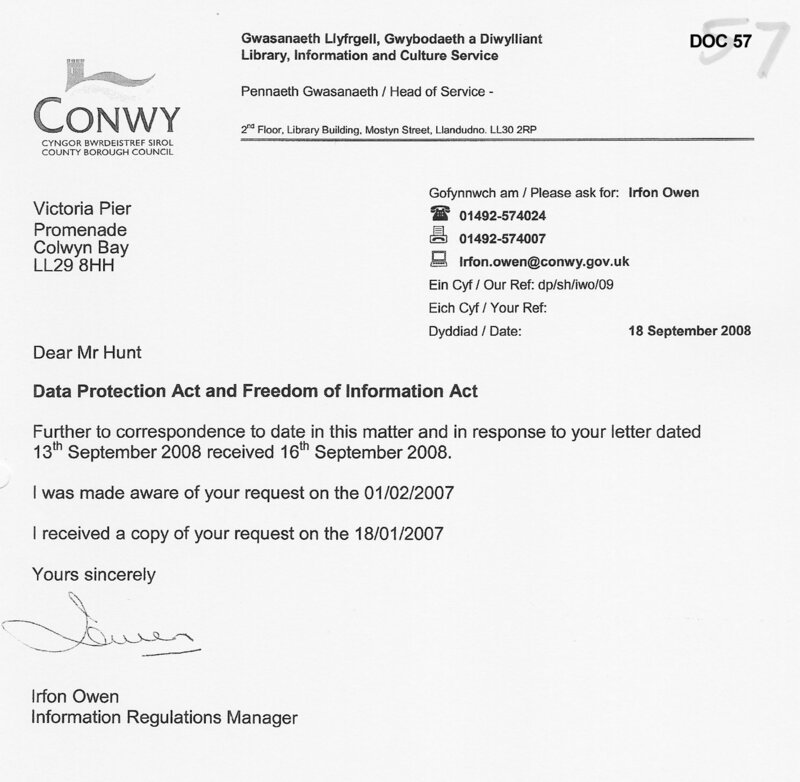 Irfon Owen, CCBC's Information Regulation Officer, has now admitted that he received my original request for information on 18th January 2007, even though he blatantly LIED to myself and the Information Commissioners Office on 17th July 2008 that he had "only recently been made aware of my requests" 18 months is not "recently". However, despite me asking for clarification, Mr Owen absolutely refuses to reveal whether it was his own decision not to process my request back in January 2007, or whether some other person at CCBC told him not to. Clearly he is either fearful of incriminating himself further, or is covering up some wider conspiracy, probably under threat of his job. I suspect the latter is the case, as I can think of no reason at all why Mr Owen would have had any grudge against me back in January 2007. [doc 57] Personally I think he is being made scape-goat by others at CCBC. 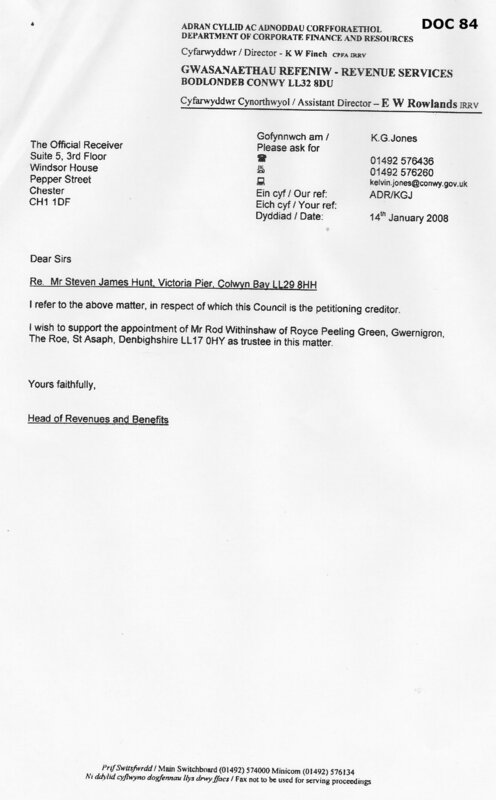 However, Mr Owen's admission that he did in fact receive my request on 18th January 2007, [doc 57] plus additional evidence such as the fax from one CCBC department to another dated 18th January 2007 [doc 59] and these various internal emails [doc 60] and [doc 61] [doc 61 page 2] prove beyond any doubt that my request was received by Irfon Owen and the Information Regulation Unit and also circulated to, and well known by, several senior officers in various departments at CCBC in January / February of 2007. These are the same few names that keep cropping up time after time: Irfon Owen, Colin Bailey, Eryl Rowlands, Derek O'Connor, David Rogers. 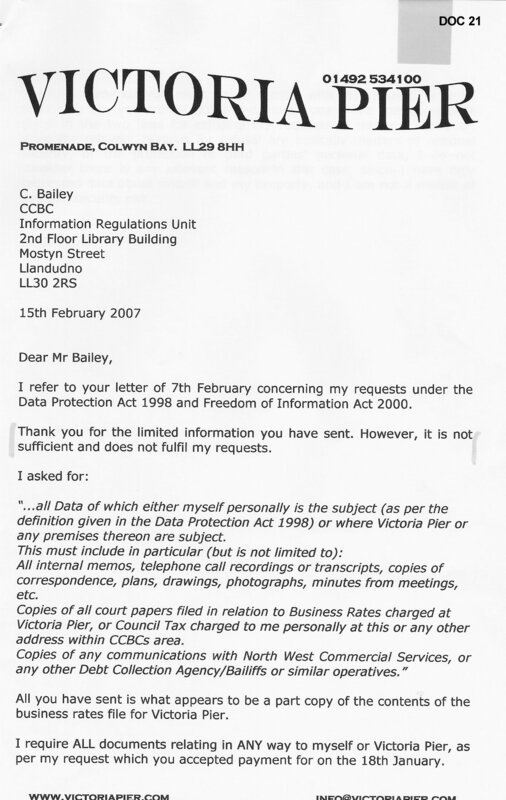 On 1st February 2007 Colin Bailey wrote to me on various matters. 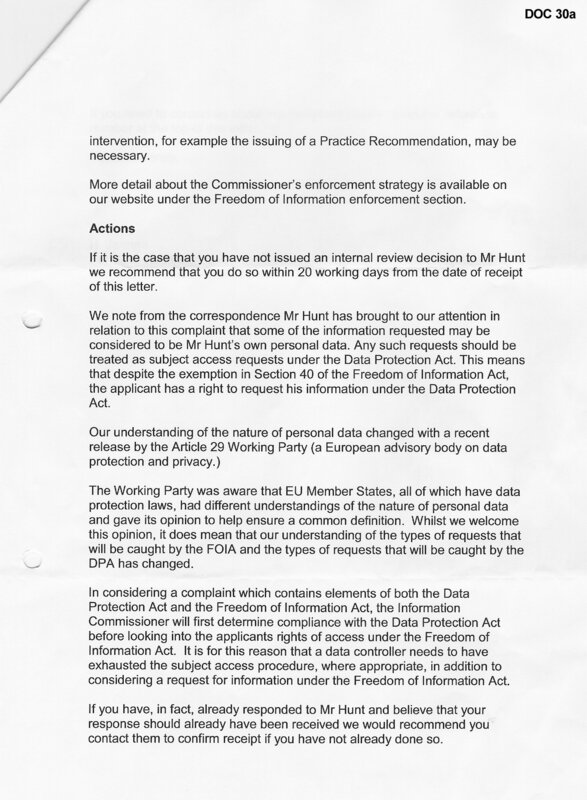 At the very end of his letter he confirms "Your letter to the Freedom of Information Act 2000 and Data Protection Act 1998 has been forwarded to the relevant personnel who will respond to you as soon as possible" [doc 62] [doc 62 page 2] [doc 62 page 3] yet again confirming it was received and apparently being dealt with in early 2007. 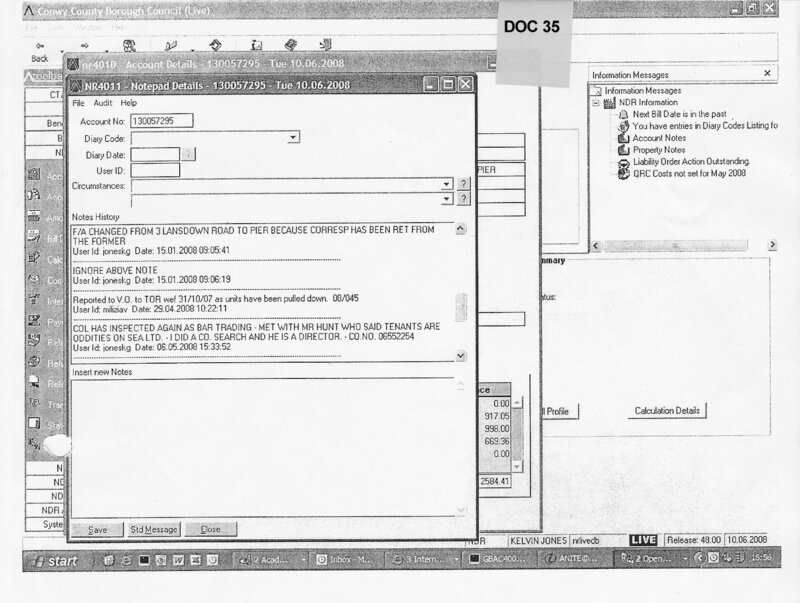 My data request was being processed in January / February 2007, as proven above and from what Derek O'Connor is saying in his internal email [doc 61] [doc 61 page 2] about being conscious of the "clock ticking" etc., all seems to be as it should... Then all of a sudden there is no more mention of my information requests at all. No references in any documents. No emails. No faxes. No notes. Nothing. It completely disappears without trace. How could all these people in the many different departments involved suddenly 'forget' what they are doing all at the same time? Especially after Derek O'Connor had told everyone they only had a limited time to do the job? Perhaps not surprisingly, there is no recorded communication telling all these people and departments to stop my data request, equally there is no record of any communication between any two of the people involved along the lines of "are we still dealing with this request?" 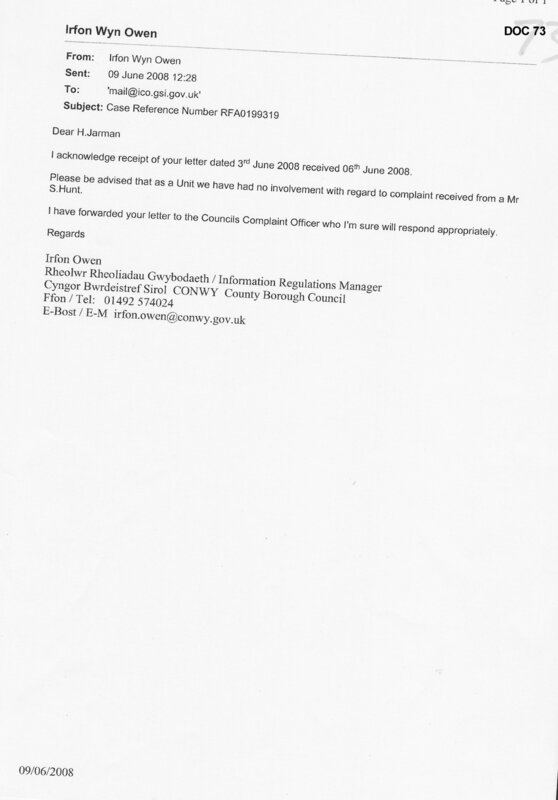 or "we have found some revelvant documents" or "we have no documents in our department" Also there is no indication that a single document was sent through to Irfon Owen at the Information Regulations Unit to be collated and checked prior to fulfilling my request. Very strangely all mention of my information requests just suddenly completely vanishes within CCBC. Someone clearly stopped the process, and told every single person involved not to discuss it. Who decided to suddenly stop processing my information requests in February 2007? Why did they instruct all the various people to stop the process? why is there no record of this instruction? What did that person or persons not want me to find out? Why did CCBC decide to lie on numerous occasions about my request being "sent to the wrong department", which is proven to be a complete lie and an attempted cover-up. 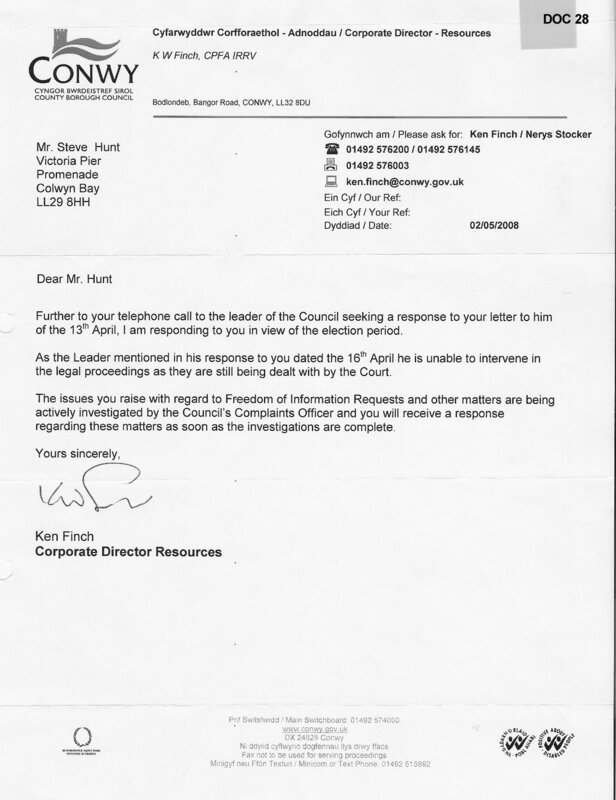 Ken Finch, Corporate Director of Resources at CCBC, responded on 23rd November 2007 stating that the matter was now being dealt with under their "Corporate Complaints Procedure" by Eryl Rowlands [doc 11]. To this day, I have never received an answer from Eryl Rowlands as to why my information requests have not been dealt with. The same old handful of names crop up time and time again - so you can see this was hardly a genuine independent complaint process was it? 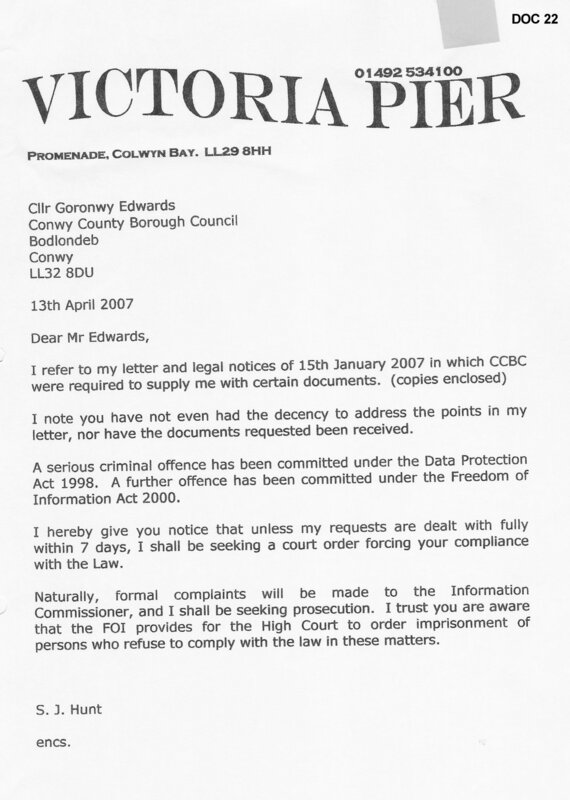 On 13th April 2008 [doc 24 page 1] [doc 24 page 2] [doc 24 page 3] [doc 24 page 4] [doc 24 page 5] [doc 24 page 6] I wrote to Goronwy Edwards, leader of CCBC, about the continued failure to deal with my information requests, and also stating that although I had spoken to Eryl Rowlands, he had not resolved the complaint regarding my information requests. 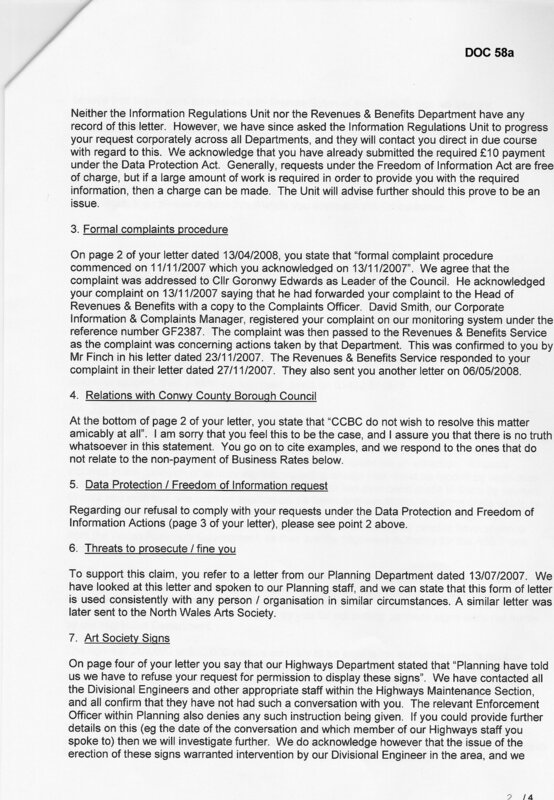 On the 16th April 2008 [doc 25] Goronwy Edwards replied that I should take the matter through their corporate complaints procedure - even though Eryl Rowlands had allegedly started this process 5 months earlier on the instructions of Goronwy Edwards! - So the leader of CCBC was now saying I should make another corporate complaint that my first corporate complaint, which itself was a complaint about non-compliance with my information requests, had not been dealt with? Confused??? - so that would have been a complaint about a compliant about a complaint about CCBC not complying with the Law. WHAT UTTER NONSENSE! - remember this prat was supposed to be the LEADER of CCBC! - pretty much sums them up? 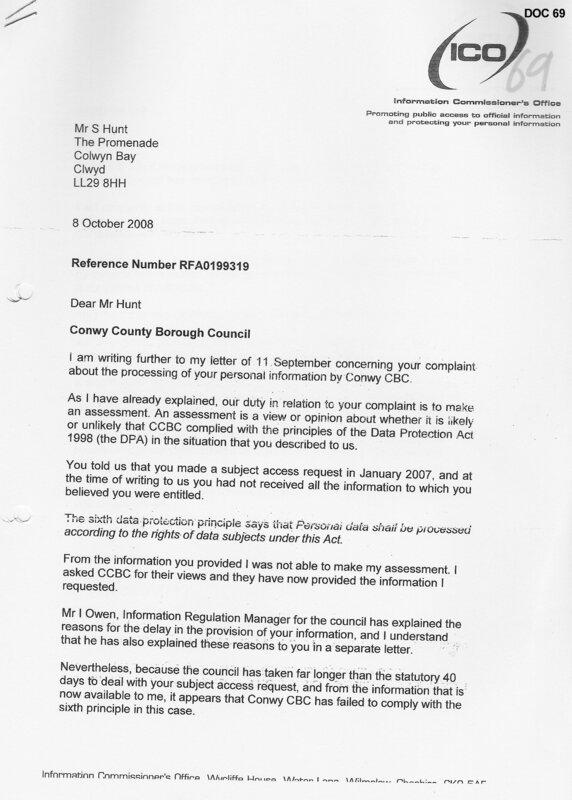 Given all the above, why did Irfon Owen tell the Information Commissioner on 9th June 2008 that his unit had no involvement with my complaint about the Councils failure to process my information requests, when the complaint was about his very same unit? 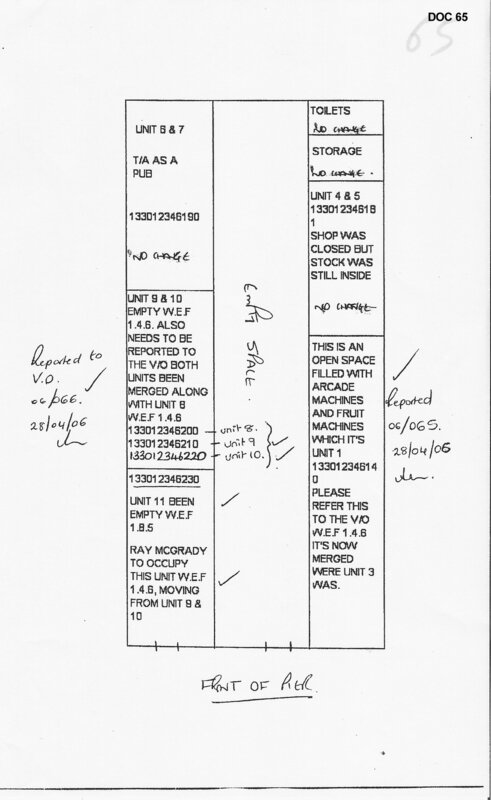 [doc 73] Could that be because the original Eryl Rowland corporate complaints procedure never actually took place? That would explain why the very unit the complaint was about apparently had no involvement at all. 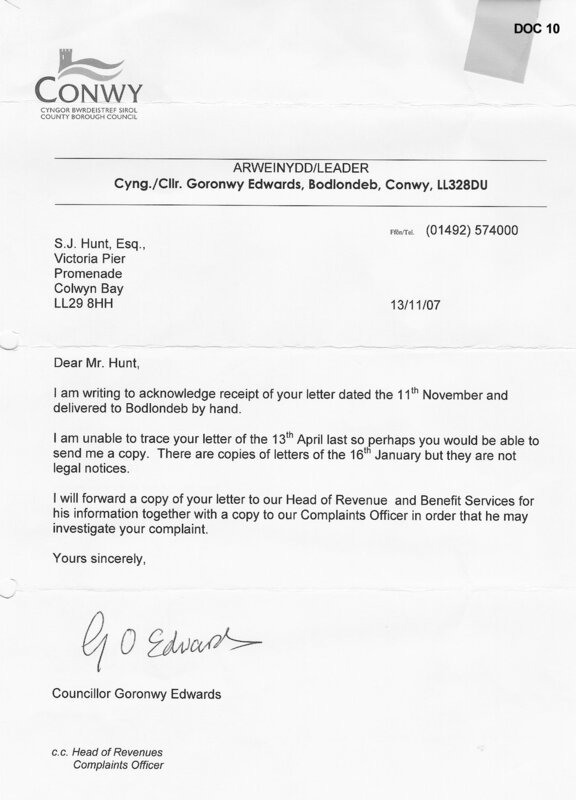 If this Eryl Rowland corporate complaint procedure did indeed take place, what was the outcome of his investigations into why Irfon Owen's information regulation unit failed to comply with my information requests? - and why have I never been notified of the outcome? The same few names turn up time and time again in these affairs. Partly just because of their jobs, but I always thought there was more to it than that... Kelvin Jones and Colin Bailey in particular... We have to wonder just why is the Senior Recovery Officer, basically the council's in-house debt collector (Kelvin Jones) and the Local Taxation Manager (Colin Bailey) so involved in my requests for information under DPA / FOI? - they should have nothing to do with it at all, other than being asked to disclose the documents their respective departments hold, just as every other department at CCBC should have been asked. 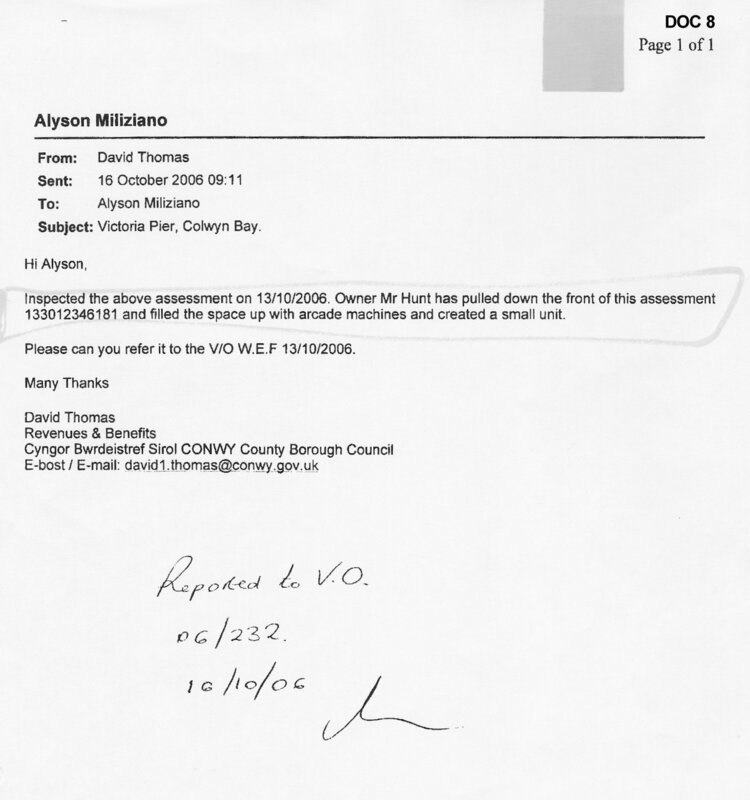 It is not in Kelvin Jones' or Colin Bailey's remit at all to get involved with the Information Regulation Unit's handling of information requests. Something very fishy going on here. 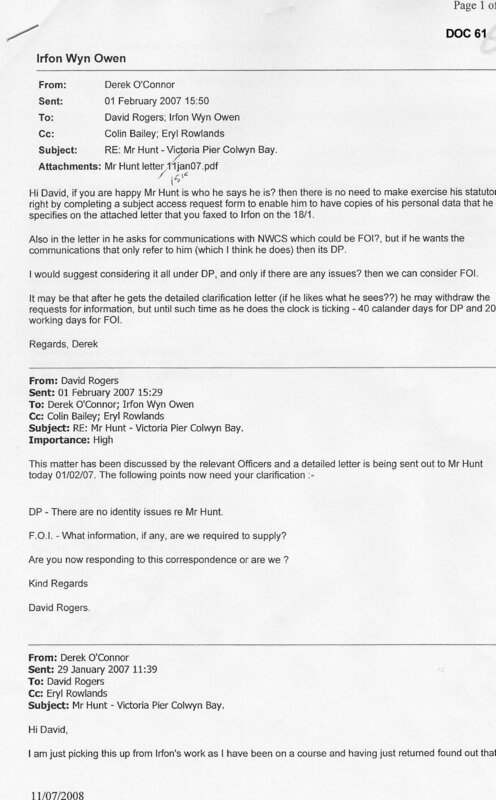 Now then, this internal CCBC document [doc 63] is calling a "Highly Important" meeting at Colin Baileys office on 13th June 2008, with Irfon Wyn Owen and Kelvin Jones as "Required Attendees", to discuss the subject "Mr S Hunt Victoria Pier F.O.I." It is a 1 hour meeting, and very significantly states that the time taken up by the meeting must be shown as "Out of Office" - WHY? - Why are these same old names being told to record their time spent in a meeting discussing me as being "out of office", when they were clearly IN a council meeting IN a council office ON council business? - unless of course it wasn't 'official Council business' and they wanted to cover their tracks and leave no trace that this meeting ever took place? From this 'Highly Important', one hour long meeting, there are no notes, no minutes, no letters produced as a result of the meeting, no other internal emails or memos or records or mentions of the meeting at all. Given how "Highly Important" this meeting was, that is very odd in itself don't you think? What was this meeting discussing myself really about? 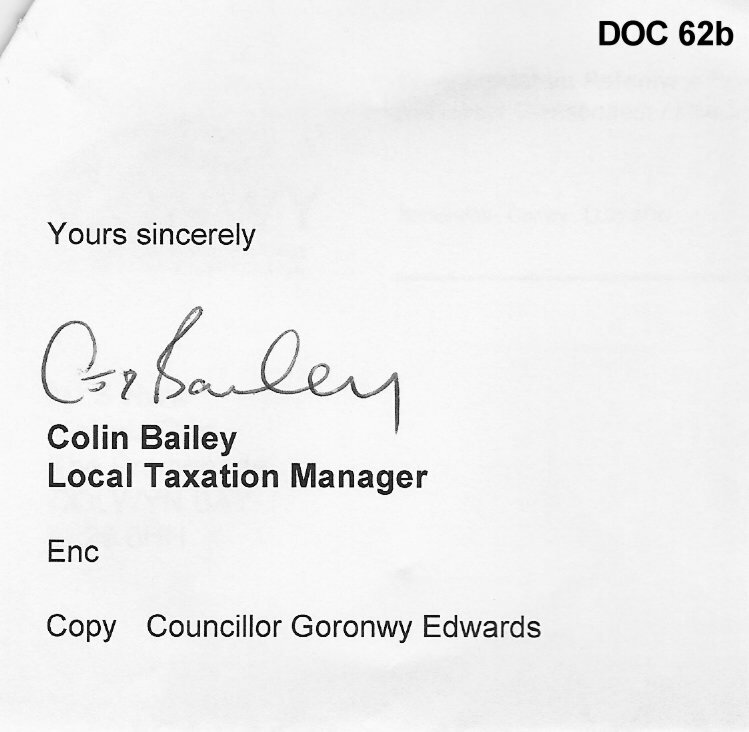 Why on earth is the local taxation manager (Colin Bailey) calling a meeting about an FOI request? He has absolutely no remit whatsoever to do so. 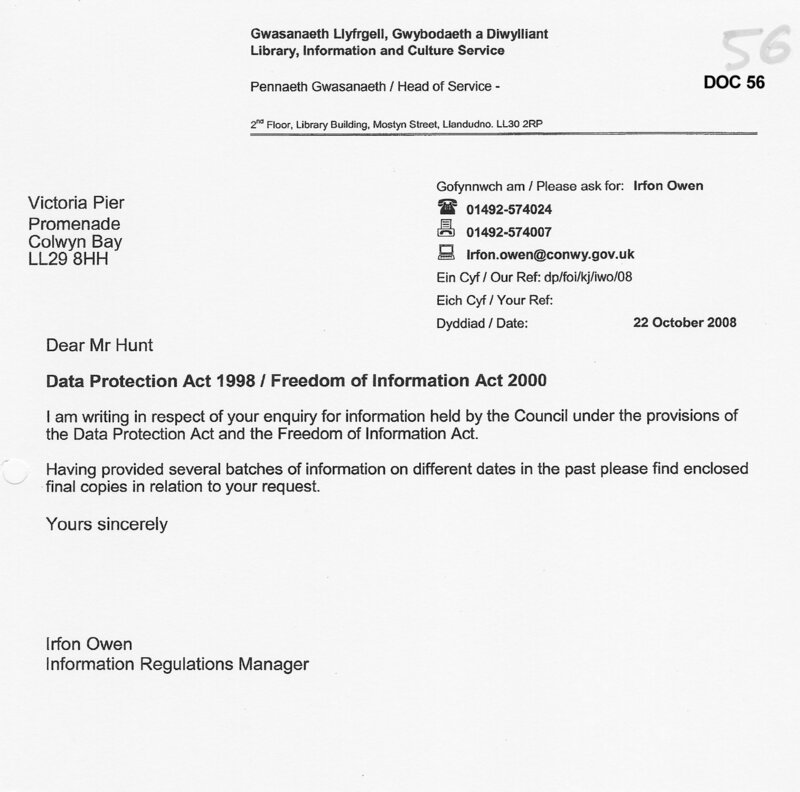 The FOI request should be dealt with by Irfon Owen and his Information Regulation Unit office. Kelvin Jones has nothing whatsoever to do with FOI requests, so why was he called to this meeting to discuss my information request and no-one else? This is extremely significant and very very dodgy indeed. Something is very clearly not right here. The stench of corruption is vile. 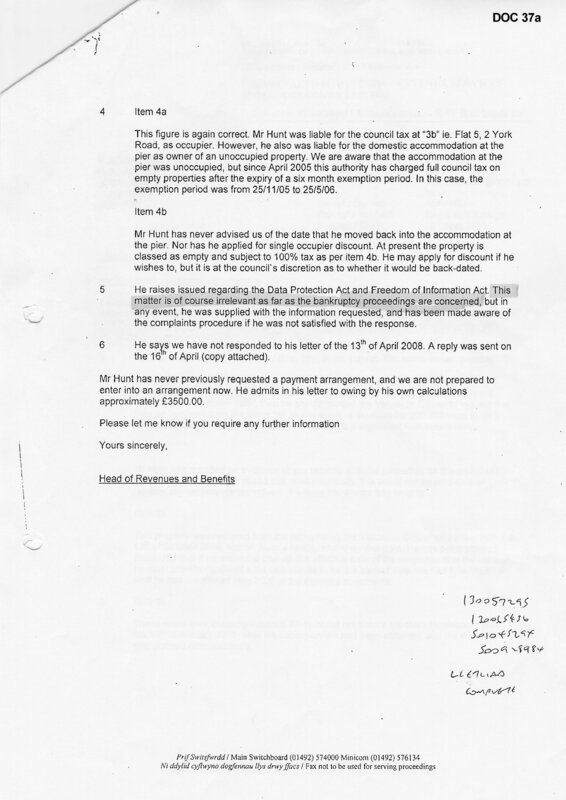 It was on 17th July 2008, a month after the mysterious secretive unrecorded meeting, that Irfon Owen told me by telephone he had "only recently been made aware of" my information request. 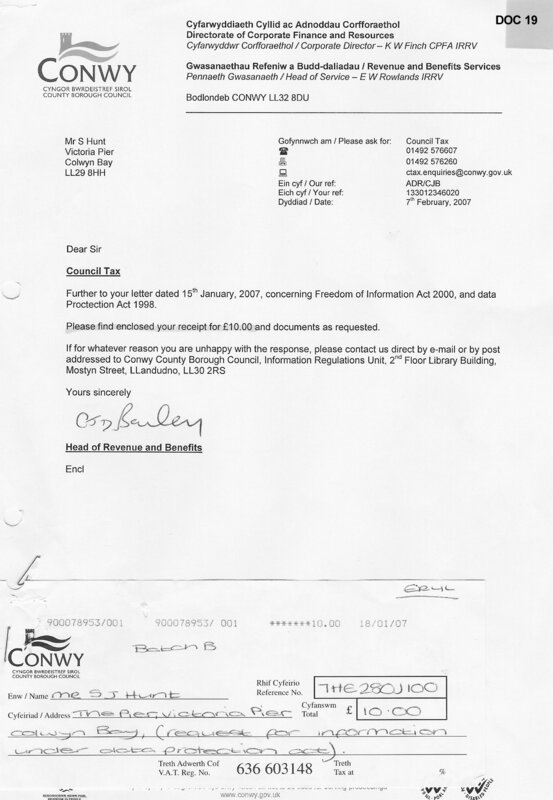 He also told the exact same story to the Information Commissioners Office... this, of course, is now proven to be a complete and utter lie, and Irfon Owen has now admitted to his lies in writing by admitting he actually received my request 18 months earlier, in January 2007, as shown above. 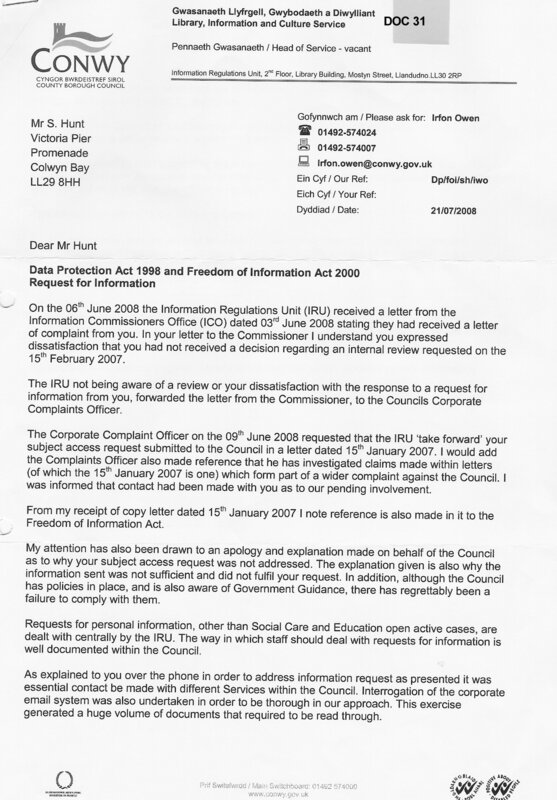 Indeed it is shown that work on my information requests had actually commenced in January 2007, then was suddenly stopped with absolutely no explanation as to who stopped it, or why it was stopped. 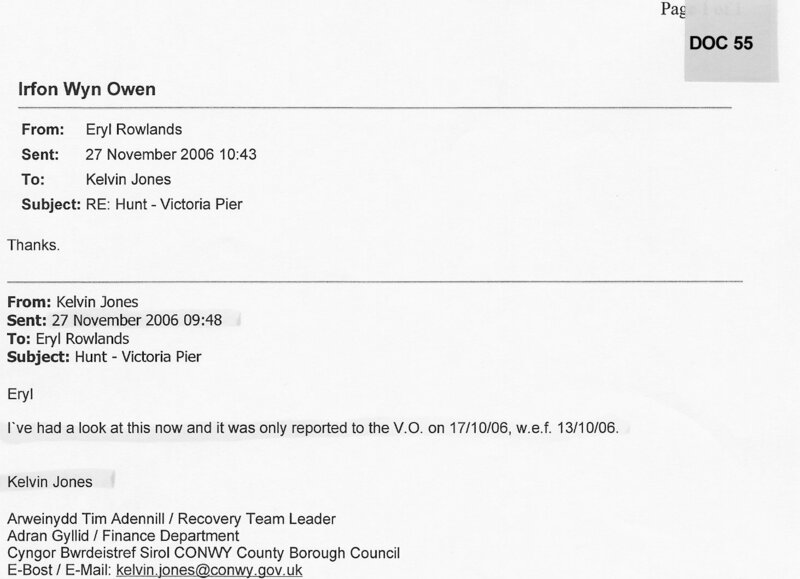 Well if Kelvin Jones, Colin Bailey and Irfon Owen could make a convincing case that my information request had "gone to the wrong department" and hadn't been received by Irfon Owen until around June 13th 2008 (the date of this dodgy secret meeting), then they could 'legitimately' not release any of my information for a further 40 days, which would comfortably get them past the bankruptcy hearing date safely in the knowledge that there was absolutely no way in which I could successfully defend their untrue claims and lies in Court... Then by telling the Information Commissioners Office, just minutes after the bankruptcy order was made, that they were now ready to send me my information (within the 40 days of my request 'suddenly appearing' on Irfon Owen's desk), they would hopefully satisfy the ICO enough not to get investigated by them, and hence their plot would never be uncovered. The most important thing to note here is that the "wrong department" that they LIED about my request originally going to by mistake is COLIN BAILEY'S own department... suddenly the pieces of the jigsaw slot in place. 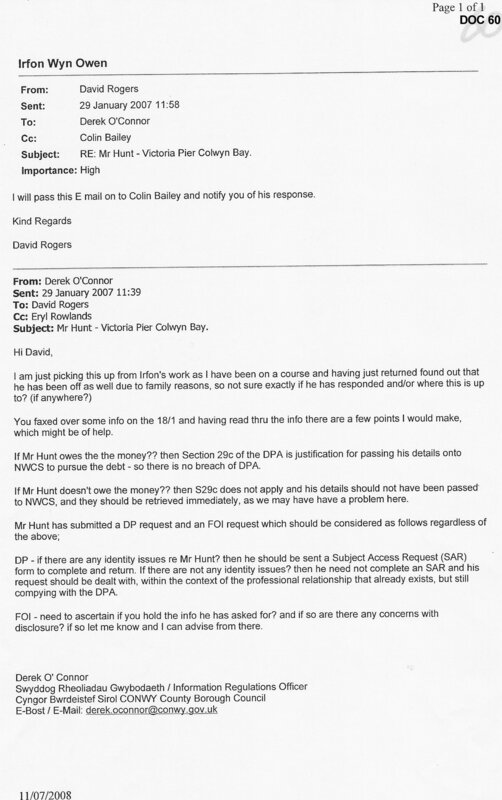 Did Colin Bailey and Kelvin Jones collude with Irfon Owen as to what documents they should and shouldn't reveal to me? Was it Colin Bailey & Kelvin Jones who put a stop to processing my information request 18 months earlier, with another of their top-secret meetings? - that would explain why there is no trace of any instruction to stop processing my request - if it was done verbally at a top-secret meeting so there was no records on the system to be found at a later date? Why did they refuse all attempts to sort the issues out amicably? Why did they not just correct the bills which they absolutely knew to be incorrect? Why did they refuse to take my money, when that's supposedly what they wanted? Why do they still hide information to this day, if they have nothing to hide? Why the secret cloak and dagger meetings, and why the absolute refusal to release ANY information from them? Above all else, why this tangled web of lies, lies and more damn lies? There must be some grand over-riding reason for this massive and complex plot, web of lies and secretive meetings other than just trying to con me out of a few hundred pounds in business rates? I don't believe for one minute a few hundred quid was their motive. This is indicative evidence of very serious collusion and corruption. Even though the withholding of DPA / FOI information could be seen as relatively low-level offences on their own, there is clearly a whole lot more to it all than just that. Given it eventually led to my malicious bankruptcy, because I was denied any way of defending their now proven PERJURY and proven FRAUD, this again constitutes a deliberate Perversion of the Course of Justice. Following several months of investigations, the Information Commissioner wrote to me on 8th October 2008 [doc 69] [doc 69 page 2]. They stated their opinion that CCBC had not complied with the Data Protection Act by their failure to process my information request within 40 days of 18th January 2007. It is as good a statement as you can get from the ICO, since only a Court can actually make a firm ruling as to whether or not the Law has been broken. Section 7 of The Data Protection Act provides that a data subject (I.E. myself) can take civil action via the Courts against a data controller (I.E. CCBC) who is in breach of the sixth principle of the Act (not releasing information). 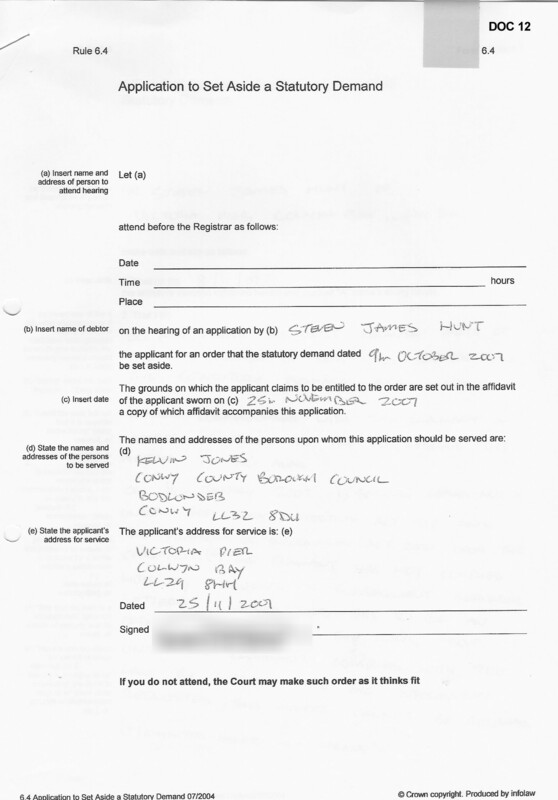 So I filed an application at the Colwyn & Conwy County Court, which was scheduled for hearing on 13th February 2009. Despite unquestionable evidence proving CCBC had broken the law, despite CCBC having admitted in writing to failing to provide information (thus admitting to breaking the law), and despite The Information Commissioner stating their opinion that CCBC had broken the law, CCBC filed a defence to my claim in a bizarre attempt to try to defend their unlawful actions. Clearly CCBC had no chance of winning the case, they were clutching at every last straw desperate not to be forced to release the information to me. Just what were they hiding? Why on earth would a public authority, which is supposed to be fully accountable and subject to scrutiny, go to such extraordinary lengths to avoid releasing what should only be very dull and boring information about a local businessman and his premises? What was in their files they were so desperate to keep secret? 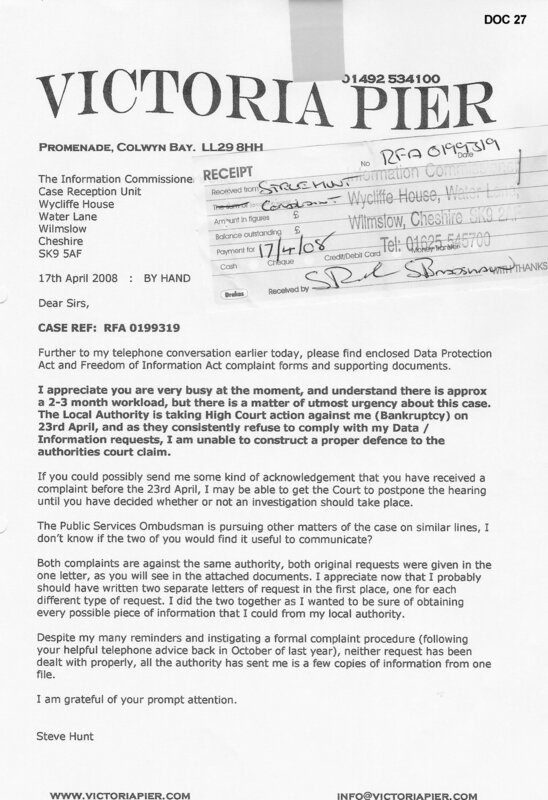 CCBC's attempts to defend the Court case were purely vexatious and intended to delay further the date at which they were finally forced by a Court to provide my information which they should have sent to me without argument 2 years earlier. CCBC then tried to get the hearing adjourned. However, at the hearing of the adjournment application on 6th February 2009, the Judge rejected CCBC's application, and stated the hearing should go ahead as listed. 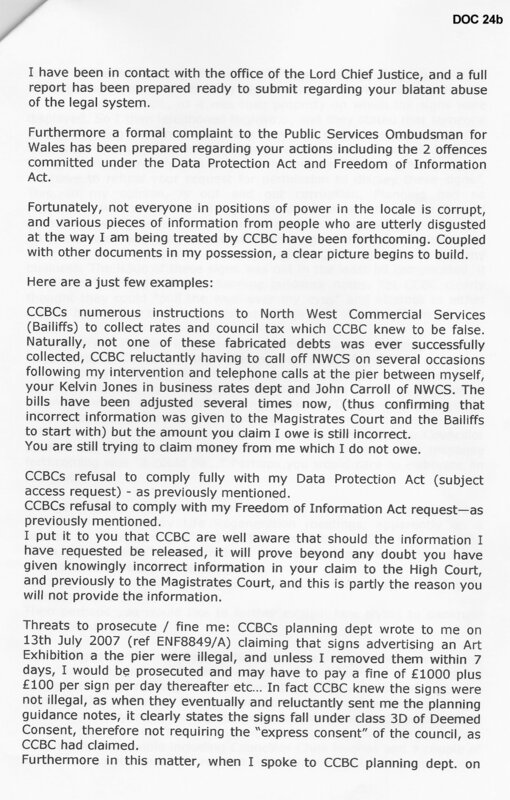 At the hearing on 13th February 2009, CCBC had to admit to the Judge that they had failed to process my information requests. Then in an almost unprecedented move, the Judge ordered that CCBC must disclose to the court all correspondence between CCBC and their external solicitors DWF LLP. [doc 82] That ruling went against the 400-odd year old principle of Legal Privilege, and is extremely significant. CCBC's in-house solicitor representing them at the hearing, Peter Brown, had never known a court to make this ruling in his career. David Jones, MP, who is also a trained solicitor, also recognised the significance of this and said it shows how seriously the court thinks the over-riding case is. He has also never known a court to order against legal privilege. Nor have my own lawyers. I half expected CCBC to appeal the court order, although doing so would obviously have made it look even more likely that they were trying to hide something incriminating - much easier to accept the judgment and just keep stuff hidden? The Court was going to examine the documents and decide which I could have. However, the Judge suggested to CCBC that if the documents were not contentious (which of course they should not be) then there should be no real reason to release them directly to me? CCBC's Peter Brown reluctantly had to agree to save face in front of the Judge. 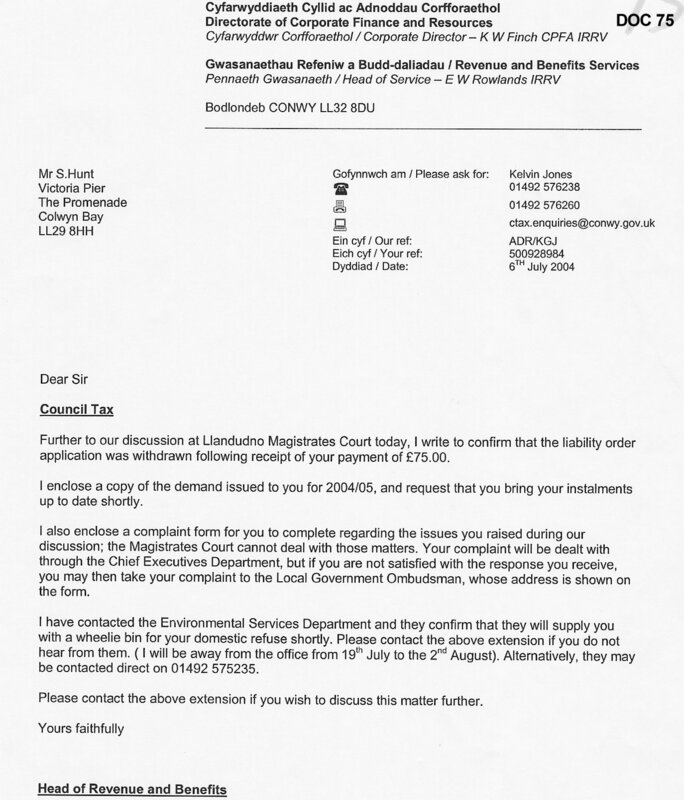 CCBC refused to comply with the Court Order by not paying my costs of £138.83, so I obtained a Warrant of Execution from the Court which added £55.00 onto the costs order, and the Court sent the Bailiffs in to the Council Offices to collect the full amount. 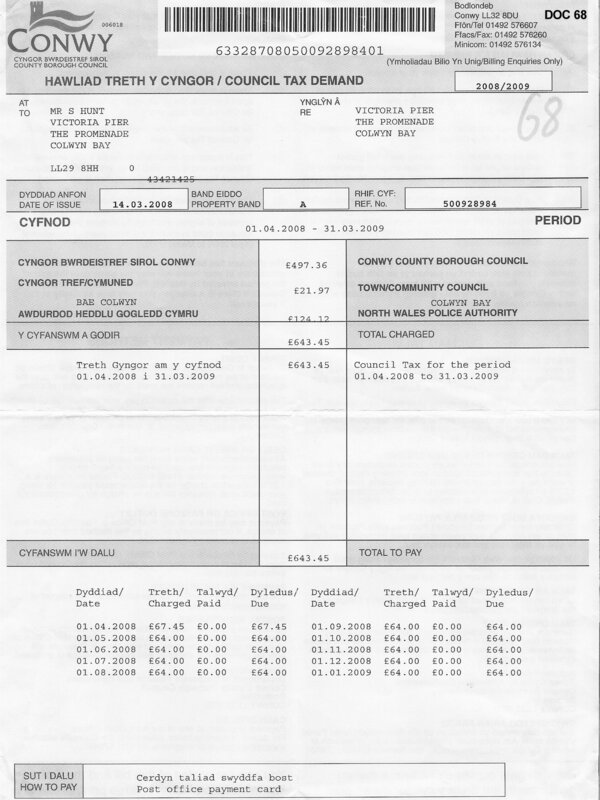 CCBC then decided to LIE to the Court Bailiff by claiming they had paid the costs, when they knew full well they had not. Upon learning of the lies, the Warrant was re-issued by the Court, and CCBC decided to pay £138.83 into the Court (thereby admitting they had lied about having already paid me!) but they now refused to pay the £55.00 Bailiffs costs. Subsequently, the Court ruled that the Council MUST pay the £55.00 costs, but again CCBC refused to pay up, insisting yet another Court Hearing take place at yet more cost to the taxpayer!... 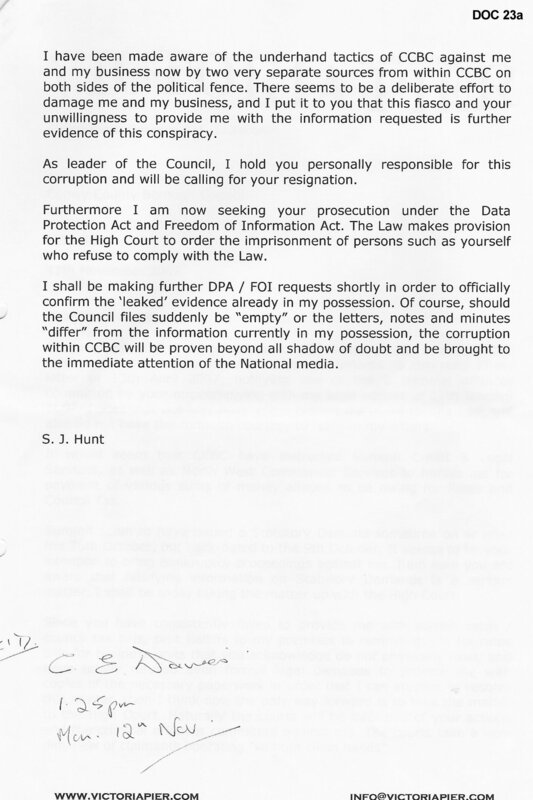 Finally on 15th September 2009, at the Court hearing that CCBC had demanded, CCBC didn't even bother to turn up! 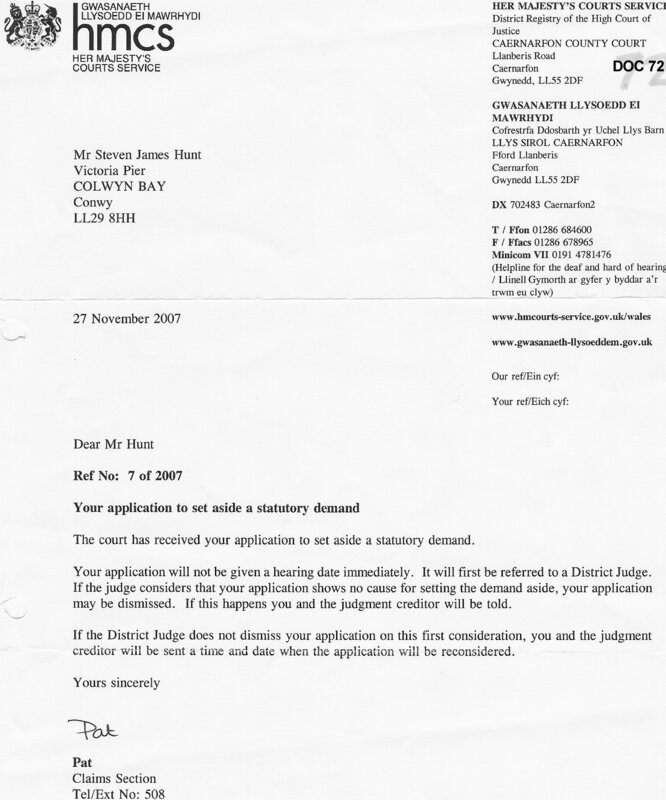 Upon reviewing the evidence, the Judge ruled that the Council MUST PAY me the £55.00 by 4.00pm on 29th September 2009, which they finally did. So, that was nearly £200.00 of taxpayers money wasted in costs, PLUS CCBC spent hundreds of pounds of taxpayers money on internal and external legal work, plus all their own court costs, etc., all on a case they could never win in the first place. Of course, if the Council had not wilfully broken the Law, I would not have won the original case against them. My suspicion is that CCBC did not wish for me to receive a certain document or documents which I might be able to use against them in the Bankruptcy proceedings, but wanted their internal records to show that document(s) had allegedly been sent to me. It should be noted that I only discovered this had happened AFTER the bankruptcy hearing, when CCBC started to release a few documents. 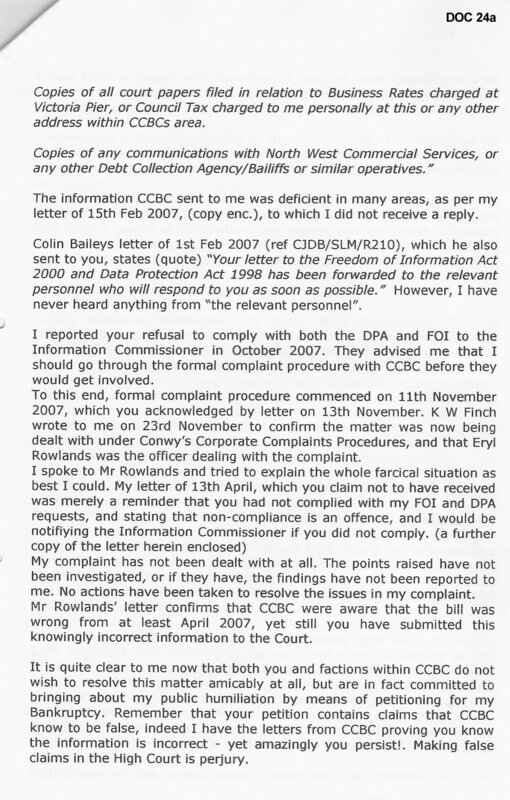 This is another reason I think CCBC refused to release documents under my FOI / DPA requests until after the hearing of the Bankruptcy Petition, because now I have this information, it shows some very dubious practices by Kelvin Jones, and proves he is a liar time and time again. I rented a flat for a while in Lansdowne Road, moving out on 17th October 2007, as the property changed hands and the new owner gave me notice to quit as he wanted to develop the property. The following chain of events happened AFTER I had moved out of this property, and I had no knowledge of it at all until I started to piece it together from the 3 batches of limited information I received from Irfon Owen in July-August 2008. I moved from Lansdowne Road on 17th October 2007. Kelvin Jones can hardly use an excuse such as 'interdepartmental error' or 'someone else did something wrong by mistake', since his name is on everything. He is also fully aware my permanent address is Victoria Pier, since he has written to me here several times both before and after this short period in January 2008. There is clear intent to ensure I did not receive the refund notice of 21st January 2008, and possibly some other correspondence was sent during this time too, as may eventually be revealed. Kelvin Jones ensured that CCBC records would show that the refund notice had supposedly been sent out to me, and that I hadn't responded to it, even though he was certain I would never receive it. The Fraud Act 2006 s.3 makes it a criminal offence to commit Fraud by failing to disclose information. s.5(3) states that a "Gain" includes a gain by keeping what one has, as well as a gain by getting what one does not have. By contriving to keep money that was due to me, FRAUD was committed under section 3 of the Fraud Act. Kelvin Jones can never have thought I would get sight of his sneaky little notes on his computer. Why did Kelvin Jones suddenly decide to send letters about pier business rates to Lansdowne road, when he never had done before? When post was returned to him, why did Kelvin Jones ask Colin Bailey to have a "discrete look" to see if I still lived there? - if it was legitimate council business, why not simply knock on the door and ask if I live there, or telephone me, or visit me at the pier and ask me directly? - The "discrete look" is obviously very significant, as there is absolutely no need to be discrete. Quite the opposite in fact if you are trying to attract someone's attention in order to give them a refund notice, surely! Was the purpose of being "discrete" that Kelvin Jones wanted to be sure I didn't live there, rather than that I did?, if that makes sense. 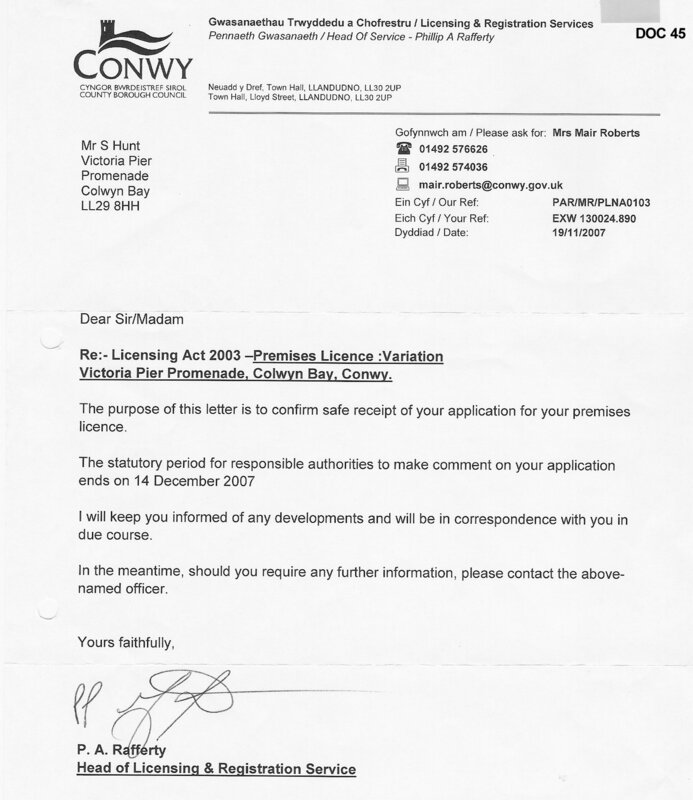 - Why ask if the landlord has a forwarding address, when Kelvin Jones knew my permanent address was the pier? - because he wanted to make sure that anything sent to Lansdowne Road would definitely NOT reach me? - After all, if he wanted to make sure I received the refund notice, he would have simply sent it to the pier where he had always written to me at, and received replies from, in the past. After Kelvin Jones makes a note to change my address to the pier, why does he suddenly change his mind literally a few seconds later? Why would he still want to send things to an address he is getting mail returned from? It makes no sense whatsoever - UNLESS he didn't want me to get the notice, but wanted to make his computer records look as if I had. When Kelvin Jones gets the official report back confirming I moved out of Lansdowne Road 3 months previous, and that the landlord has no forwarding address for me, why does he not change my address back to the pier again? 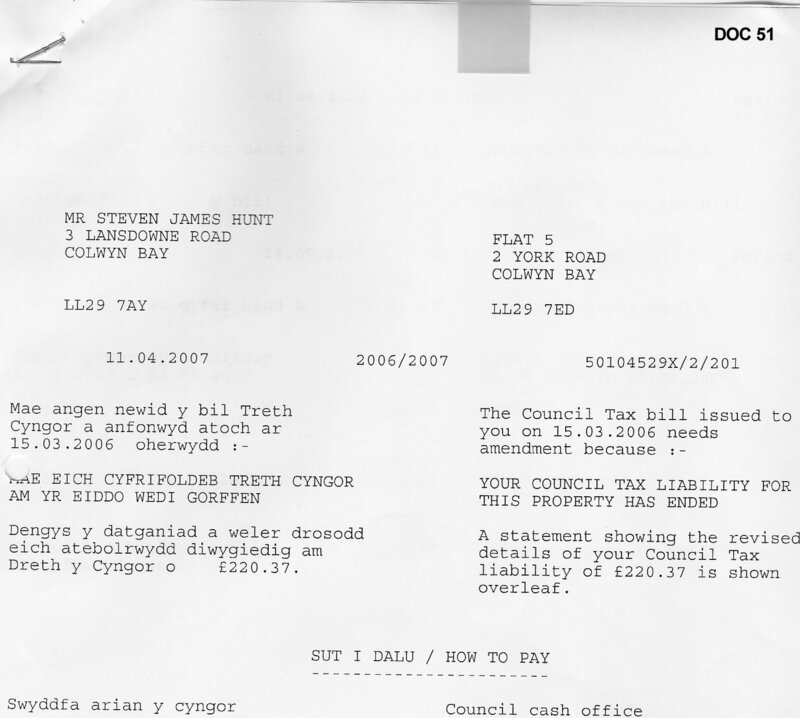 Why 4 days later send a council tax refund notice to an address that by his own documented investigations he was absolutely certain I would not get? The only possible reason is that he did not want me to receive it. It should be noted that the refund notice was only sent the once, no other effort was ever made to inform me of it, like sending a copy to the pier for instance. 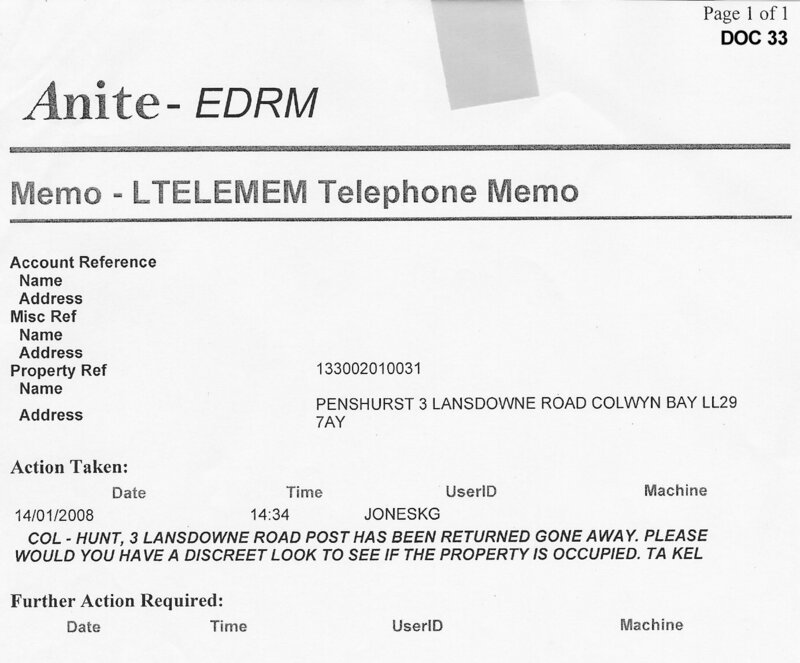 Why did Kelvin Jones decide to write to me at Lansdowne Road for this very short period in January 2008 only, significantly being the time when the bankruptcy petition was being prepared and filed, when for the rest of the time I have lived around here he has always communicated with me at the pier? CCBC, Kelvin Jones directly it appears, has unlawfully withheld from me the sum of £97.05, being a sum of money owing as a result of an overpayment of Council Tax. 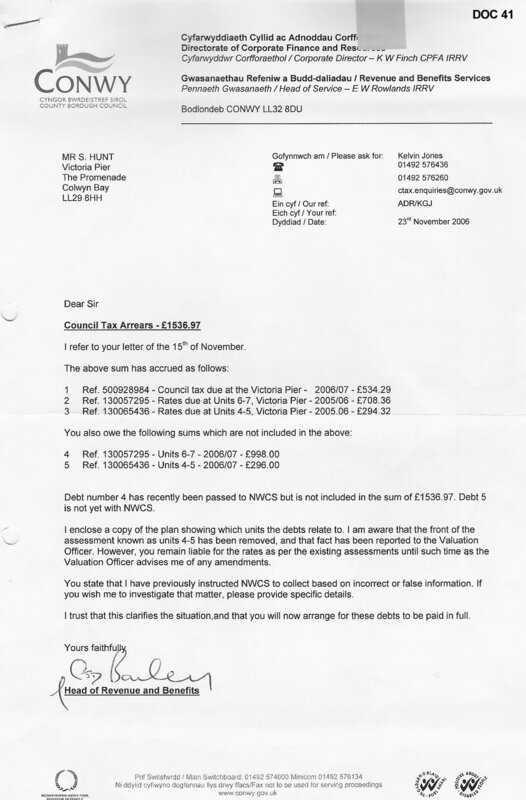 I believe Kelvin Jones has deliberately contrived to conceal this overpayment from me - the reason for this concealment could have been to avoid the Bankruptcy Proceedings being dismissed by the Court, since it proves beyond any doubt that I did not owe the sum claimed of £5,144.88 at the time CCBC / Kelvin Jones presented the Bankruptcy Petition to the Court. 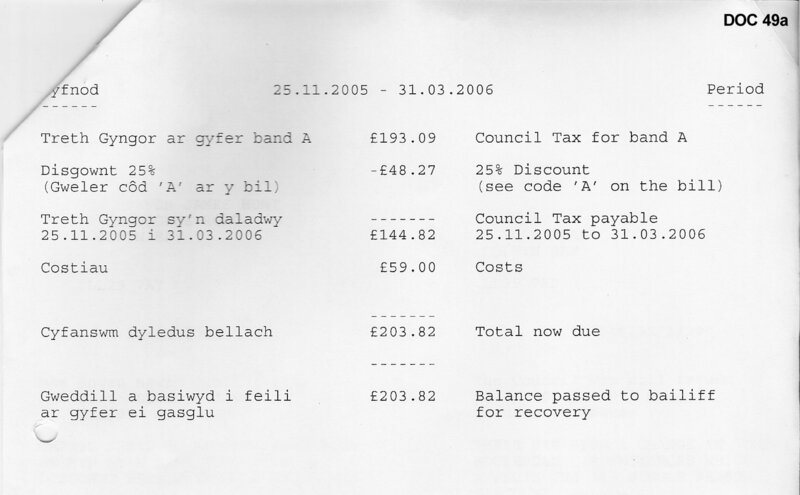 It should be noted here that CCBC sent a refund notice to me on 21st January 2008, which was 9 days before filing the bankruptcy petition at Caernarfon County Court, and therefore Kelvin Jones / CCBC was fully aware that the amount being claimed in the bankruptcy was fraudulent, since CCBC / Kelvin Jones clearly acknowledge I was already in credit to them by £97.05. The above proves Kelvin Jones was fully aware that the amount of alleged debt to CCBC as claimed in the statutory demand was untrue, BEFORE the bankruptcy petition was even filed at the Court. 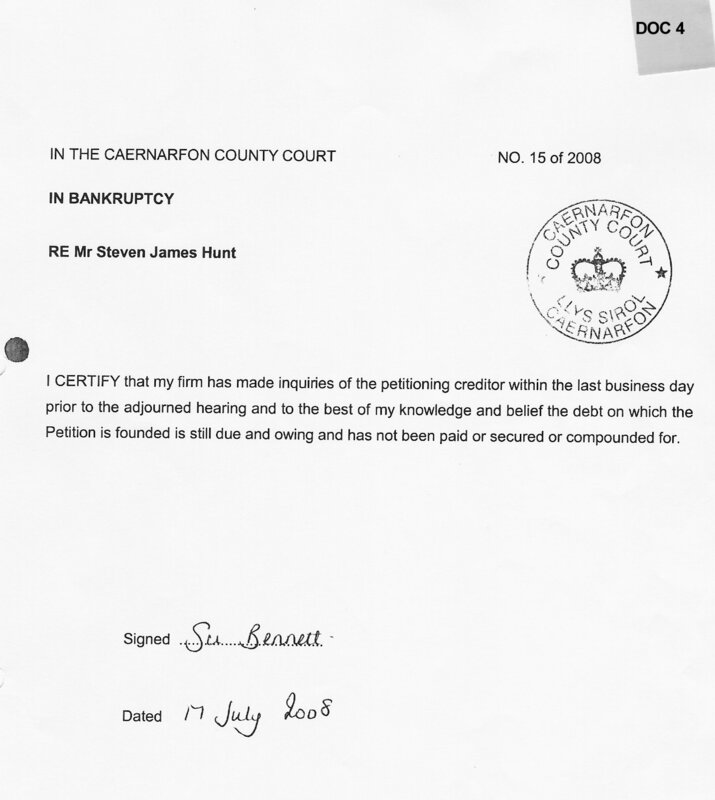 It also proves again the written statement to the Court at the bankruptcy hearing on 17th July 2008 [doc 4] was knowingly untrue - both those acts constitute PERJURY. 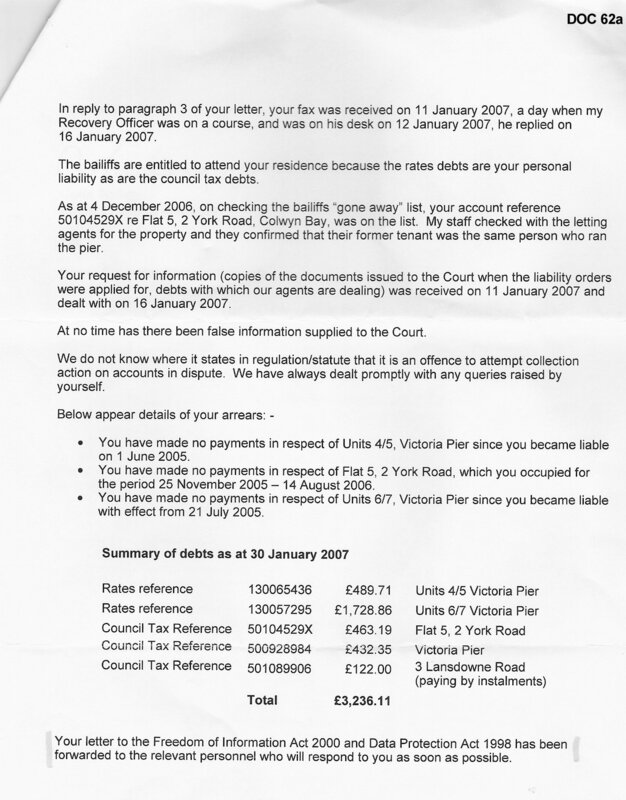 The first time I was made aware of this sum of £97.05 owing to me was on 21st July 2008 - 4 days AFTER judgment was made. This credit owing has never been mentioned in any other telephone call, letter or email from Kelvin Jones or indeed anyone else at CCBC. The money owing to me has not been applied to any of the accounts in dispute, nor has it been refunded to me, nor has it been credited to my current (or last years) Council Tax bills. The relevant law [S.I. 1992 No. 613 The Council Tax (Administration and Enforcement) Regulations 1992 sec 24] makes it quite clear that any refund due must be notified to the tax-payer, and must be repaid if the tax-payer so requests, or must be applied to any other current Council Tax liability as a credit. If there is no other liability then it must be repaid whether the tax-payer requests it or not. CCBC did neither, and therefore broke yet another law. The actions of Kelvin Jones / CCBC as set out above constitutes FRAUD, since there has been a clear attempt to conceal and retain £97.05 owed to me, whilst at the same time attempting to force me in to paying an amount of £5,144.88, which by this and the other evidence here was clearly known to be untrue both before the bankruptcy petition was filed and indeed when it was heard by the Court. The £97.05 simply 'vanished' without any trace, until after the bankruptcy order had been made and I got hold of the internal CCBC documents. I let it be known I was aware of this hidden money, and it suddenly then 'magically reappeared' in Kelvin Jones' adjusted claim to RPG on 20th November 2008. Why did Kelvin Jones deliberately hide this overpayment from me? It is no 'mistake' that the refund notice was sent to the wrong address - Kelvin Jones deliberately altered my address on his computer as is shown, plus his own notes proves his intention NOT to refund the money due to me, which is FRAUD. Why did he note on his computer "DO NOT REFUND THIS CREDIT" ? - the law clearly states it MUST be refunded. Kelvin Jones committing an offence yet again. 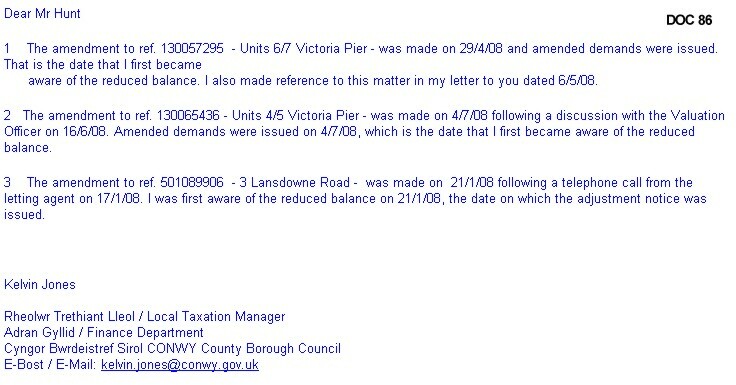 Why was no other attempt ever made to notify me of this refund due, such as writing to me at the pier? Why does this overpayment not show as a credit anywhere, even on subsequent bills? What did Kelvin Jones actually do with the money? Where did it physically go? It was not recorded on any account. "I give you this one last chance to sit down around a table like gentlemen and sort this matter out. It is very simple. Get the bills correct, then an arrangement can be made to pay what is genuinely owed." [doc 24, top of page 6] It is perhaps not very polite, but I was getting rather frustrated by now at their persistent refusal to do anything to resolve the issues. However, Goronwy Edwards completely refused my offer. I think this pretty much sums up CCBC's sentiment towards me, and illustrates perfectly their total unwillingness to talk about the issues which of course THEY caused in the first place, and only THEY could resolve, assuming THEY wanted to. 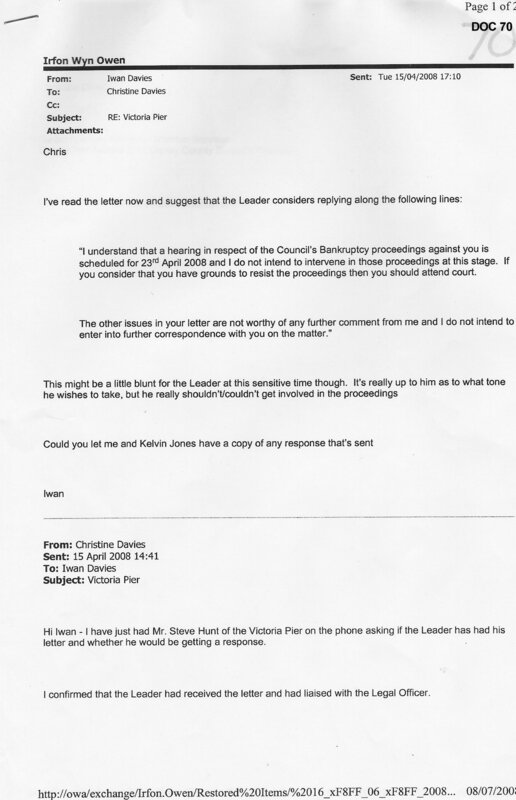 You'll notice that it was requested that a copy of this intended letter be sent to Kelvin Jones. Same old names, time after time. "trying to cloud the issue"
"I confirm that the petition debt remains outstanding and that I wish the proceedings to continue"
EVEN THOUGH it has transpired that he is unlawfully withholding £97.05 of my money at this point in time, and knows that EVERY part of the claim is still in dispute. "is of course irrelevant as far as the bankruptcy proceedings are concerned"
It is of course VERY relevant! - how could I construct any defence to his false allegations if CCBC withheld all the information? 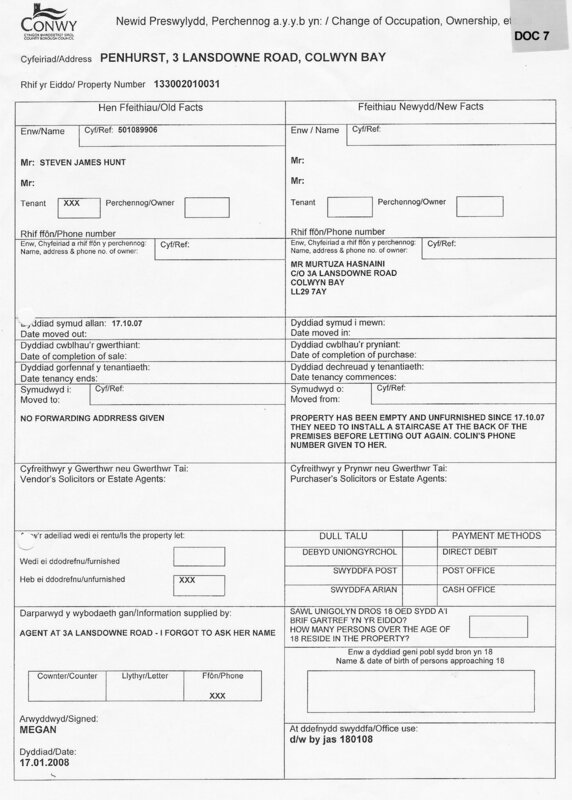 Of course, Kelvin Jones knew he was skating on very thin ice, and that the information, if provided, would lead to the bankruptcy case being struck out and himself being proved a PERJURER and FRAUDSTER on multiple counts. This yet again shows that Kelvin Jones had no intention whatsoever to resolve the matter amicably. It is absolutely clear he wanted to go to Court at all costs, rather than accept payment of what was genuinely owed. Kelvin Jones was hell-bent on making me bankrupt by any means, some kind of perverse vendetta he has against me personally it would seem. 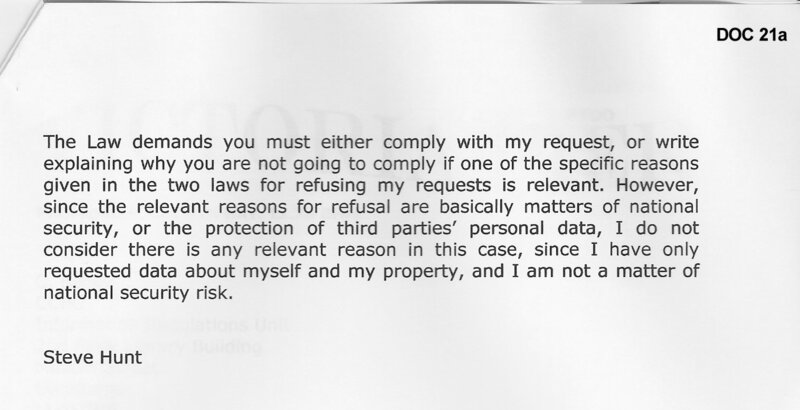 "I still wish to proceed with the Bankruptcy"
Even if Kelvin Jones, in his position as Senior Recovery Officer, can get away with claiming gross ignorance of the Insolvency Rules, he has the benefit of in-house solicitors to consult. 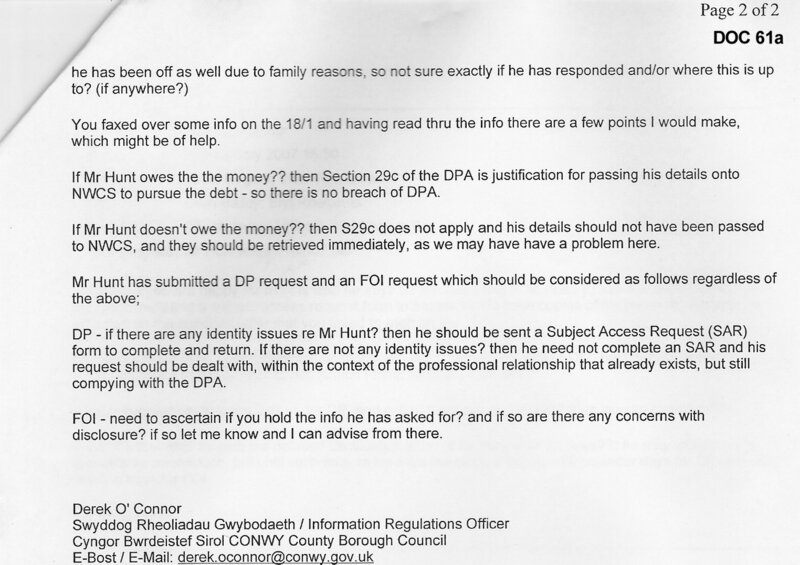 The email was also sent to DWF Solicitors [doc 1] Who should have (perhaps did?) pull him up on this point. It is unfeasible to believe that not one of these professional people knew that at this point, if not before, leave of the Court should have been sought to either withdraw or amend the Bankruptcy Petition as the amount claimed for in the bankruptcy was knowingly false. Having tried unsuccessfully for 18 months to get CCBC to issue correct bills, or to discuss the matter civilly around the table, I thought the best way forward was to pay half of what they claimed on account, even though I knew it was completely wrong, in order to substantially reduce what was genuinely owed, and yet again somehow 'prove' goodwill on my part in that I was always willing to pay the correct amounts, once CCBC sent the correct bills so we knew what the correct amounts actually were!. I had hoped that this might finally force CCBC into issuing the correct bills, so whatever bits remained could then be settled up. So on 2nd June 2008, I telephoned CCBC once more to yet again try and settle and avoid incurring completely unnecessary Court costs. Again as a gesture of good will on my part, I offered to pay 50% of the untrue total amount they were claiming for in the bankruptcy proceedings. 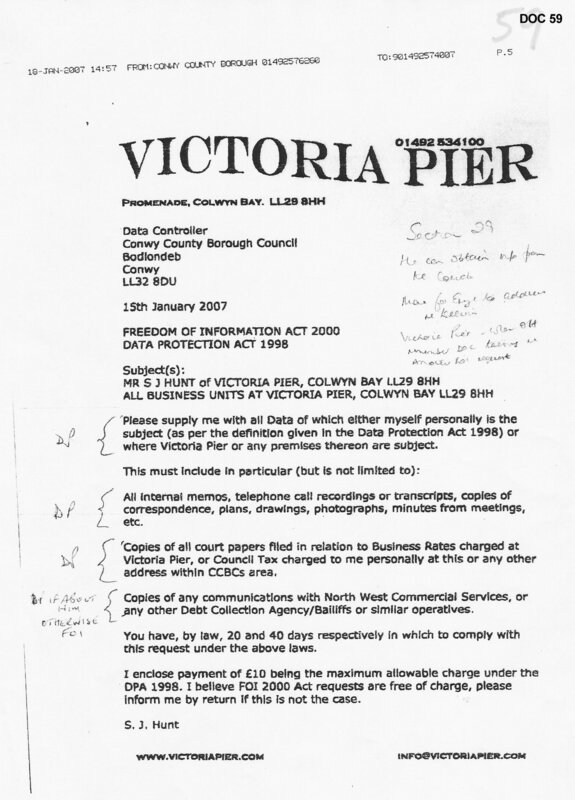 As it so happened, the bill in section 1 of their claim, for the pier bar (units 6-7) now seemed to be somewhere near right, at just over £2,500. So to keep things simple on paper, I suggested it might be easiest if I paid the bills for the bar off in full, which was near as makes no difference to 50% of their total untrue claim. Section 1 of their claim could then be cleared up and forgotten about. This seemed far more sensible to me than messing around paying 50% of each of the 9 separate parts of their claim, which would complicate matters considerably by leaving 9 odd bits to sort out - some of which would have been overpaid even at 50% of what CCBC were originally claiming after corrections were made. I also informed CCBC that the Valuation Officer was due to call at the pier the following week to check that all the rates assessments were correct and up to date, and to make any necessary changes to the rating list. This would then ensure all outstanding bills could be re-issued correctly once and for all. I stated that as these discrepancies in the bills were finally ironed out over the next couple of weeks, and CCBC issued the corrected bills, then all the bills could be paid up to date and that would finally be the end of it all - no need to go to Court. This conversation is noted on Kelvin Jones' computer [doc 38] although he has skewed it slightly by stating I agreed with all of his bills apart from 1 item, which I clearly did not! Kelvin Jones again refused what I considered to be a very reasonable and genuine attempt to settle the matter, stating I should go to Court. Obviously he did not want me to settle the bills at all, or he would have took my money. He remained utterly determined to get the bankruptcy order against me, for some kind of perverse self-gratification presumably? Kelvin Jones is supposed to be CCBC's Senior Recovery Officer (debt colelctor) - he must then know that if a debtor offers even a pound towards a massive debt, it should be accepted as then the debtor has admitted liability for the debt... so why not accept £2,500 from me? - because he DID NOT WANT the bills paid, HE WANTED to make me bankrupt. This Law states that if a creditor refuses to accept Legal Tender for a debt, then he shall not be entitled subsequently to take Civil Action for its recovery. 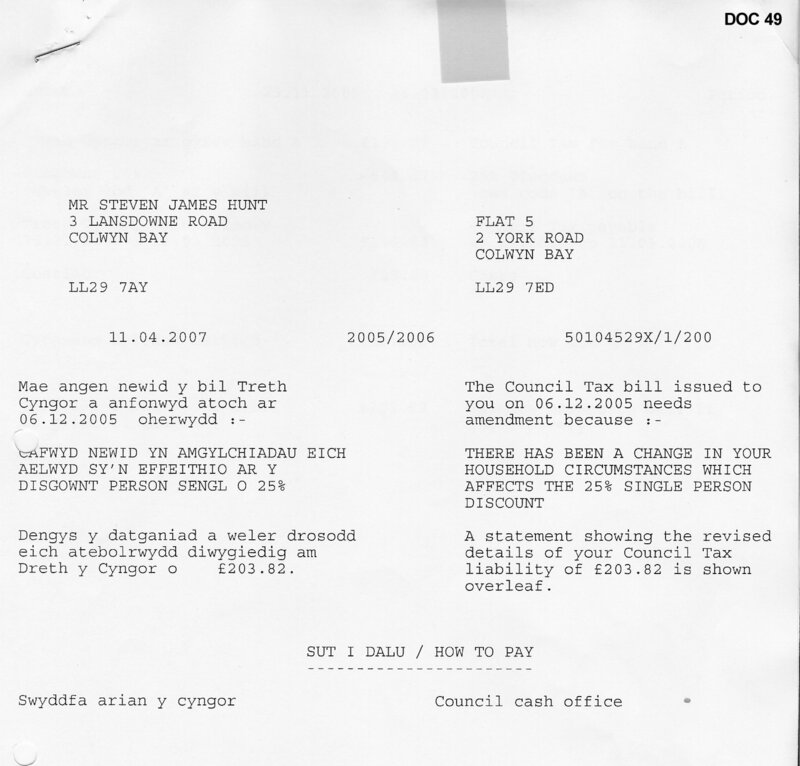 I DID offer Legal Tender for that part of the debt - I offered to go into the Council Offices in person and pay £2,500 in cash over the counter that very day - as is noted by Kelvin Jones himself on his computer [doc 38]. Kelvin Jones refused point blank to accept payment. Therefore CCBC's Legal Counsel's attempted use of the "Taylors Industrial Flooring case law" is completely irrelevant - the Council was not entitled to seek any kind of civil remedy in that part of their claim, since they had refused to accept Legal Tender in payment of it previously. Furthermore, The Insolvency Act 1986 s.271(3) gives the Court the power to dismiss the bankruptcy petition where "the offer has been unreasonably refused" My offer was not only unreasonably refused, but unlawfully refused. All other parts of their claim were clearly (and now proven to be justifiably) in dispute, and the Insolvency Rules specifically do not allow for bankruptcy proceedings to be considered on any debt (or part) that is in dispute. Therefore, had I and / or the Court been made aware of the full facts of the case, the Court would have seen that there was no claim whatsoever that could actually be heard under the Insolvency Act, and the case would have been struck out completely. Why did CCBC refuse all offers to settle the matter amicably? 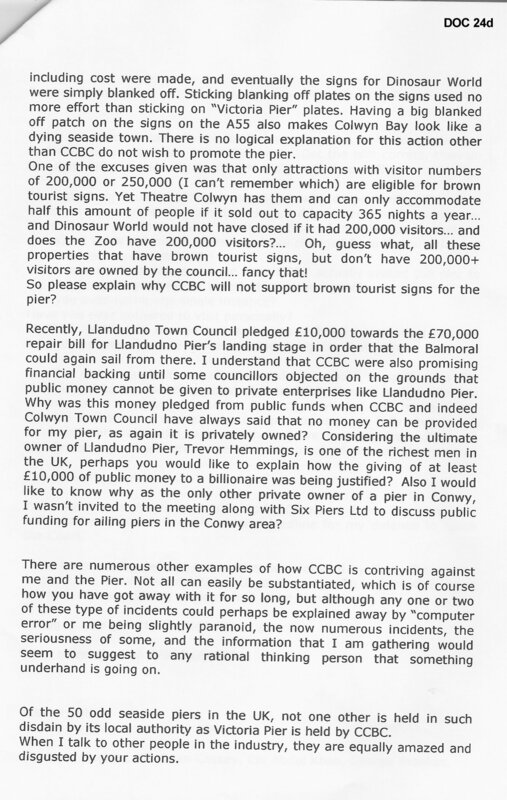 Why did Kelvin Jones refuse to accept £2,500 cash payment on account against CCBC's claim? Why did Kelvin Jones state that providing me with the information I required to both substantiate his claims and / or defend the case against me was "Irrelevant"? It is of course TOTALLY relevant! Why did Kelvin Jones "Confirm the petition debt remains outstanding" when he was deliberately contriving to conceal the almost £100 overpayment due to me, not to mention he also knew every one of the four parts of his statutory demand was incorrect? Due to unfortunate circumstances beyond my control, I was unable to attend the hearing of the Bankruptcy Petition on the 17th July 2008 to defend myself in this case and explain the reasons the order should not be made, due to injuries sustained following an assault a few evenings earlier, which resulted in me being carted off by ambulance to A&E. The Police were obviously involved too. 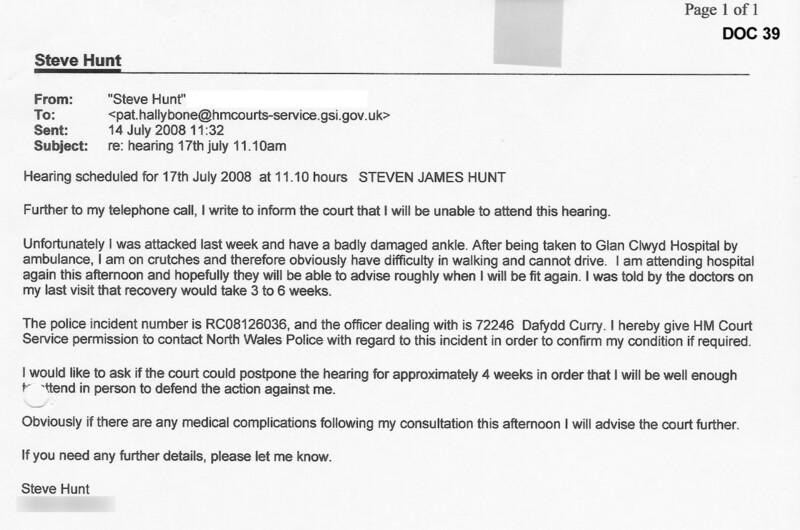 On 14th July 2007, 3 days before the hearing, it was clear that I would not be fit enough to attend Court, since I was on crutches and could hardly walk, and obviously was not safe (or legal) to drive. I therefore telephoned and emailed the Court details [doc 39], asking for the hearing to be adjourned until I was able to attend in person. I gave the Court details of the Police incident number, and permission for them to confirm the situation with the Police if necessary, since I suspected the Court might think I was making some kind of elaborate excuse. Later that day I again attended hospital for a check up and was referred for physiotherapy. 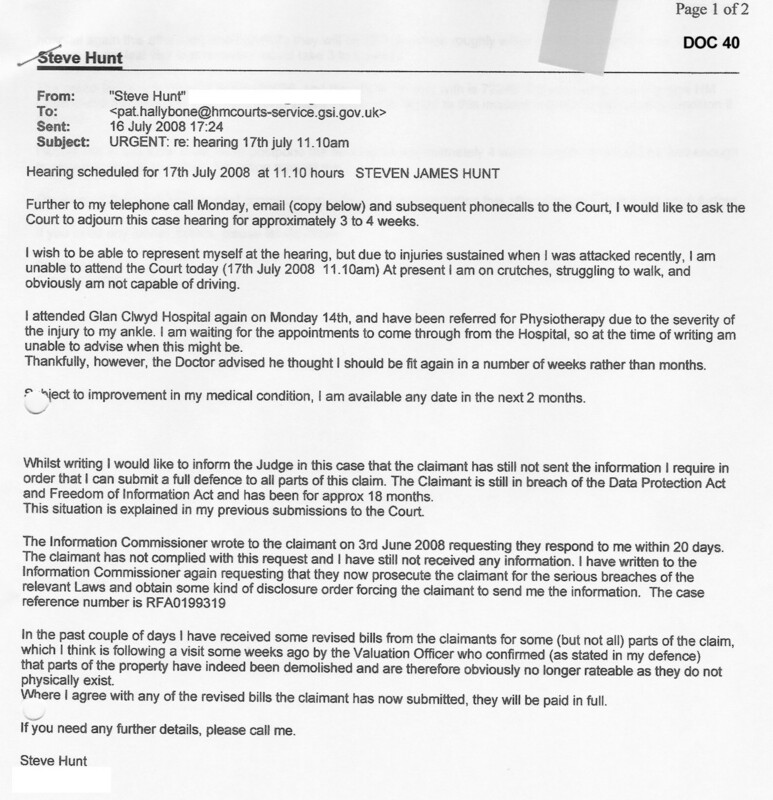 Again on 16th July 2008 I telephoned and emailed the Court to confirm I would be unable to attend the hearing and to ask the Court to adjourn the hearing until I was fit [doc 40], but for reasons unknown to me the Judge, egged on by CCBC, decided to proceed with the hearing in my absence. I was unable to present a defence to this complicated case due solely to circumstances beyond my control. It is plain to see this was never a straight-forward bankruptcy case, some of the 'facts' on which it is based having been in dispute for 2 years. I should have been given the chance to have my defence heard by the Court as per the most basic principles of Law and Justice. Of course, even if I had been at the Court on the day of the hearing, due to the unlawful withholding of information by CCBC, it is questionable how much of a convincing defence I would have been able to mount with little or no evidence available to me. The trial went ahead in contravention of Article 6 of the Human Rights Act due to the unlawful actions of CCBC who as the petitioning creditor in the case so obviously had a vested interest in making sure I did not receive a fair hearing. There has been a very serious abuse of the Court system and Legal Procedure in this case. CCBC took the Bankruptcy through the Court 'without clean hands', which goes against the fundamental principles of English Law. CCBC are persistent liars, they lied from start to finish, they still lie. Fact. My inalienable right to a fair trial was completely denied due to the proven unlawful actions of CCBC. Again, going against a fundamental principle of English Law, and the very heart of the Human Rights Act. CCBC and their solicitors, DWF LLP, gave several statements to the Court which it is shown they knew with absolute certainty to be untrue. At the time of the bankruptcy hearing, the statutory demand, on which the bankruptcy petition was founded, was known to be untrue on at least 5 separate counts. Stating it was true is undeniably PERJURY. CCBC brought what can only be described as an ongoing vexatious dispute as far as Bankruptcy Proceedings. An ongoing dispute that CCBC was never prepared to settle, despite every effort made by myself. CCBC did not want to settle. CCBC wanted to cause me as much damage as possible for their own perverse gratification. Bankruptcy is a very serious and extreme legal process meant as the absolute last resort for insolvent people or companies who have excessive debts which they have no reasonable prospect of paying. I am not insolvent, and have always offered to pay the correct bill, just as soon as CCBC decided to actually present it. CCBC continually refused to send the correct bill. The Insolvency Rules state very clearly that Bankruptcy should NOT be used as a means of settling disputed debts, and also that Bankruptcy Proceedings should NOT be issued on debts that are in dispute. How CCBC managed to persuade the Judge to completely ignore the Insolvency Rules, I do not yet know. The Judge was wrong to let the case proceed. 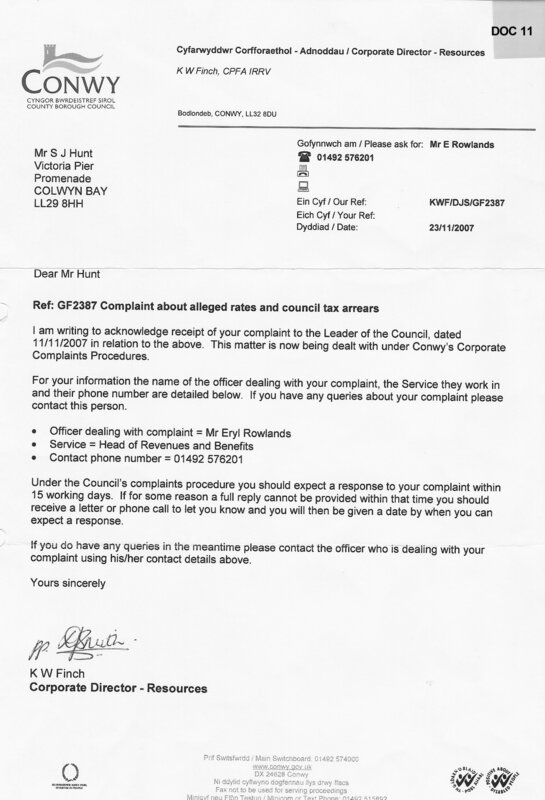 CCBC deliberately, fraudulently, withheld a sum of £97.05 owing to me since 21st January 2008. CCBC knew full well that the £5,144.88 they were trying to blackmail me into paying by threatening me with bailiffs and bankruptcy was incorrect from day one. Now I have the unquestionable proof of this in the form of CCBC's own dated documents, as you can see here. CCBC refused every single offer of negotiating talks and payment, and were determined to bankrupt me at all costs. There was no reason whatsoever for this matter ever to get anywhere near a Court. I tried many times for 2 years to get CCBC to send a correct bill, but they consistently refused to do so. Interestingly, just a few days before the bankruptcy hearing, CCBC suddenly decided to adjust several parts of their claim, but yet still swore to the Court their original claim as stated on the statutory demand was true, and carried on with the Bankruptcy regardless. Finally it must be remembered there is no law in the land which states a person must pay a bill which is known to be incorrect. Furthermore, no law should be used to enforce some other act which is in itself unlawful. Ergo bankruptcy proceedings should not be used to enforce a knowingly fraudulent statutory demand. CCBC's actions in this matter constitute several criminal offences including Fraud, Perjury and Perverting the Course of Justice. 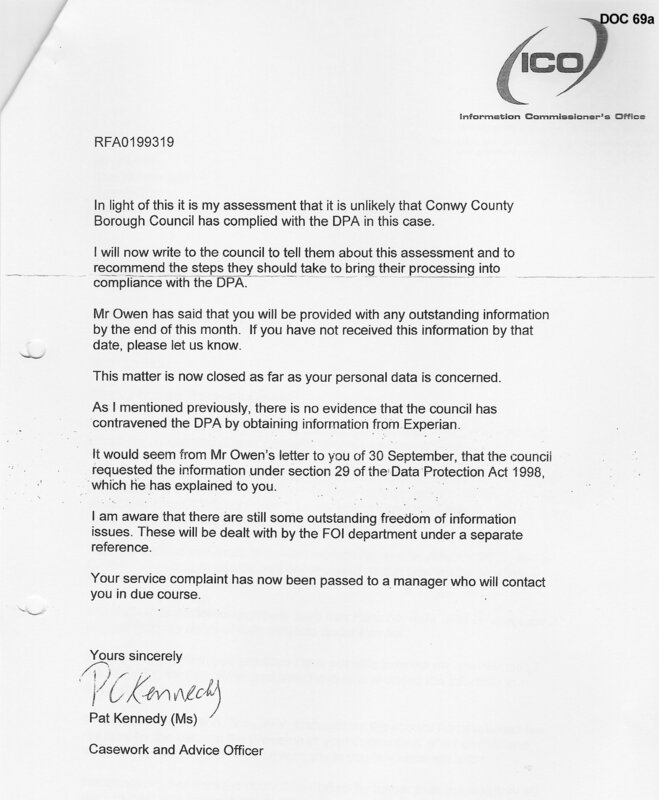 CCBC are proven 'guilty' of civil offences under the DPA and FOI. Since it can be shown that all of the above has been orchestrated by probably 3 or 4 individuals at most, it seems clear to me that one or more of these persons had full knowledge of exactly what was going on. 'errors' cannot possibly be used as an excuse, many laws have been frequently and wilfully broken. It therefore follows that one or more persons presumably has some motive for their actions, though I have yet to work out quite what that motive is. Most significantly, Kelvin Jones is involved with virtually every single document, meeting, or decision, even in cases where he clearly has no remit whatsoever to be involved. It appears he is the ring-leader. But why? As a direct result of the unlawful actions of Kelvin Jones and CCBC, I have suffered over 2 years of personal stress over this case. My business is ruined, my reputation wrecked. These are the hard facts of the matter, not just dramatic adjectives. I have been subject to repeated harassment by bailiffs calling at my business and home addresses threatening to remove goods for alleged debts which are now proven to have been fraudulent. I also had to endure the public humiliation of bailiffs calling at my business premises during open hours and making my customers aware of CCBC's falsified debts. Since the Bankruptcy Order being made public, there has been a huge amount of media interest. The long-term personal and financial damage to me is likely to be irreversible. Rumours and untrue 'facts' have spread far and wide, and it will take many years for those rumours to subside. Once rumours and stories are on the internet, it is virtually impossible to get them corrected or removed. The damage has been done. 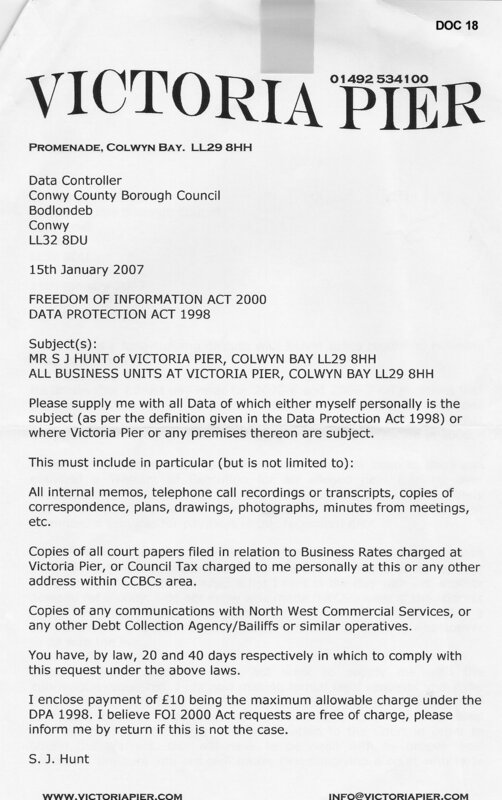 The pier was closed without good reason on instructions of the Insolvency Practitioner, who was on short first-name terms with Kelvin Jones discussing my fate 6 months BEFORE I was made bankrupt. My business and those of all my tenants have failed as a result. The pier was closed on false allegations of owing CCBC £5,000 - at the start of the summer holidays, when the pier would have taken more than £5,000 on a sunny weekend. But we all know it was never about the money, only about causing me damage. All the regular customers of the pier are now lost. Furthermore, my previous tenants and staff have also suffered similarly on a personal level. 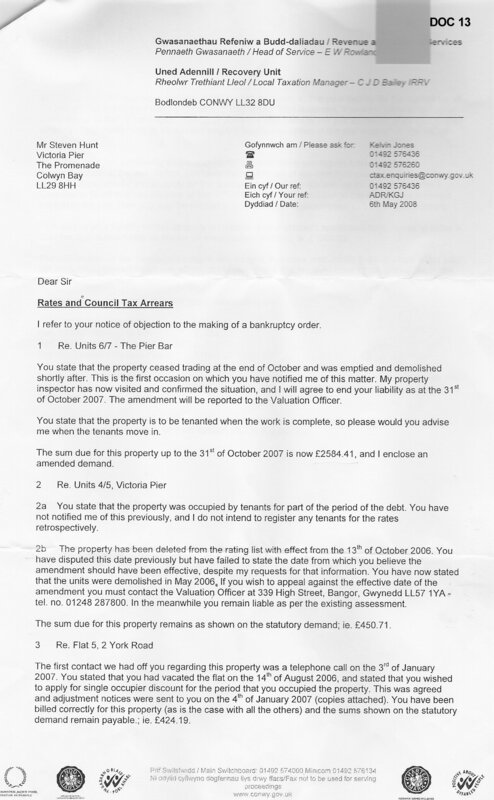 As a direct result of the malicious bankruptcy, and subsequent closure of the pier, 2 of my previous tenants have now also been declared bankrupt themselves due to losing their businesses, and their lives are equally devastated, including losing their homes as well as their jobs. The overall catastrophic effect of CCBC's criminal actions on peoples lives can not, and should not, be under-estimated. All of this has been caused by CCBC's calculated, criminal actions and someone's sheer determination to cause me and my business as much damage as they possibly could. The rates dispute is a complete smokescreen for something much, much darker. The rates dispute could have been settled in an instant at any time, had it genuinely been the issue, and had CCBC genuinely wished to settle. CCBC refused to settle. 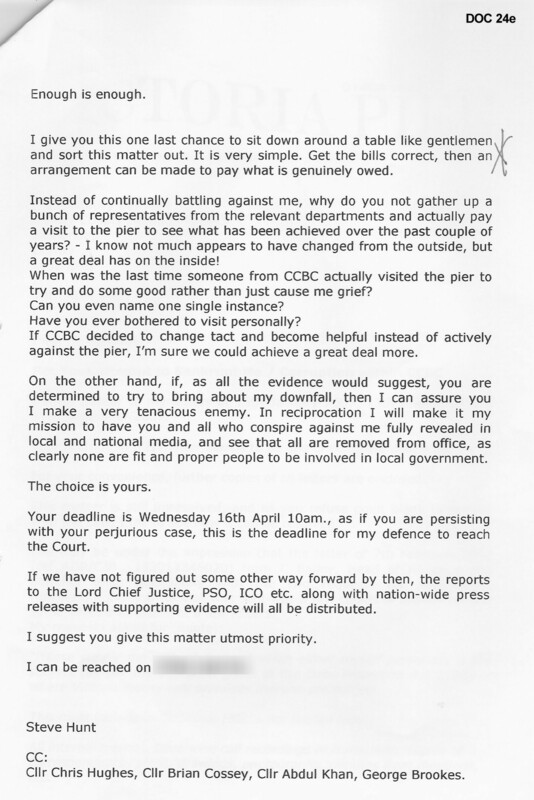 The corrupt filth within CCBC must be identified and brought to justice for what they have done not only to myself, but all those who relied on the Pier for their livelihood. Measures must be put into place to ensure no-one else has to endure this utter hell from a corrupt local authority ever again. 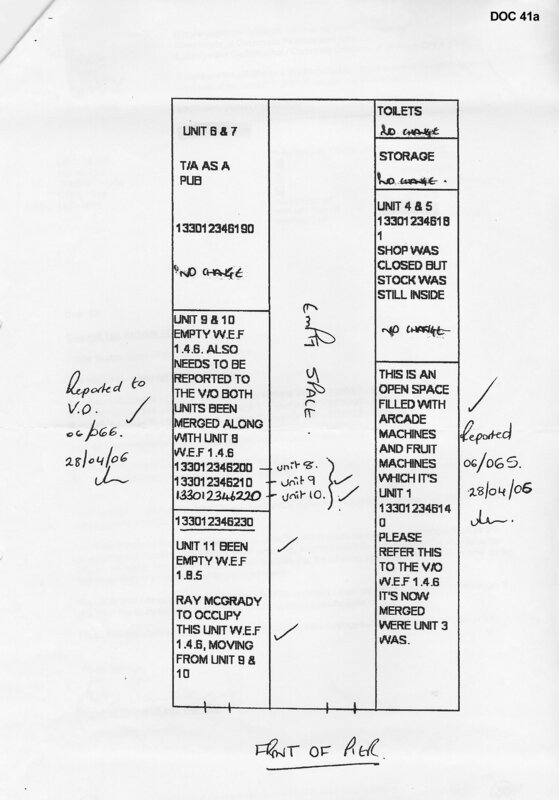 I think [doc 75] dating from July 2004 is the earliest reference to the almost permanent battle I've had with Kelvin Jones. Illegal Credit Check - persistent liar Kelvin Jones accusing ME of Fraud! Kelvin Jones obtained my personal credit file details from Experian [doc 80], without my consent. I have notified the Information Commissioner of this as a formal complaint, and also asked Irfon Owen, as head of the councils Information Regulations Unit why this was carried out. He has stated that Kelvin Jones obtained this information to investigate a fraud. I take great exception to Kelvin Jones, of all people, accusing ME of fraud, given the above evidence of his multiple proven counts of fraud against me! I have demanded CCBC explain exactly what this fraud is they are accusing me of. 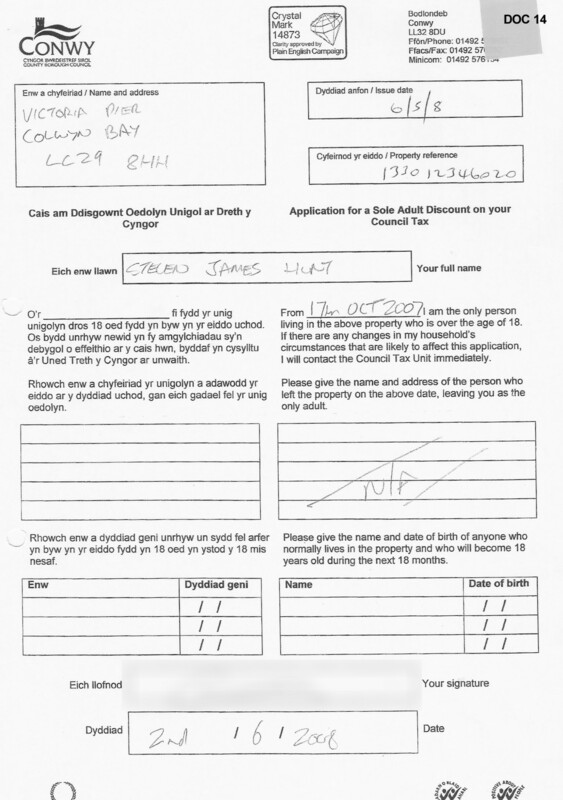 Kelvin Jones is now trying to use the excuse he lawfully carried out this credit search without my consent in order to confirm the information on the form I sent to him on [doc 14] was true (that I was sole occupier of the Pier), yet he then contradicts himself [doc 81] by saying he never received the form - this idiot can't even remember his own damn LIES from one day to the next! CCBC - I challenge you to deny any of the above. Come on CCBC, deny it - I dare you. You know you are in the wrong. You have undeniable evidence that your own officers are liars, perjurers and fraudsters. The Chief Executive has been dragged off by the Police. You have spent many times more taxpayers money fighting me, than you allege I owed. KPMG are now investigating your financial matters in connection with the pier fiasco. You know CCBC is corrupt to the very core. Your continued acquiescence proves your guilt.